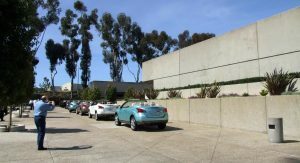 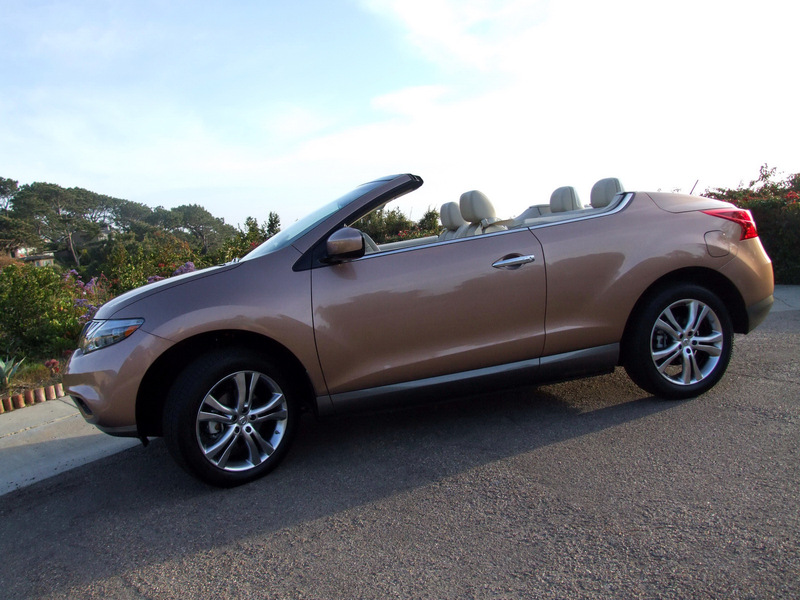 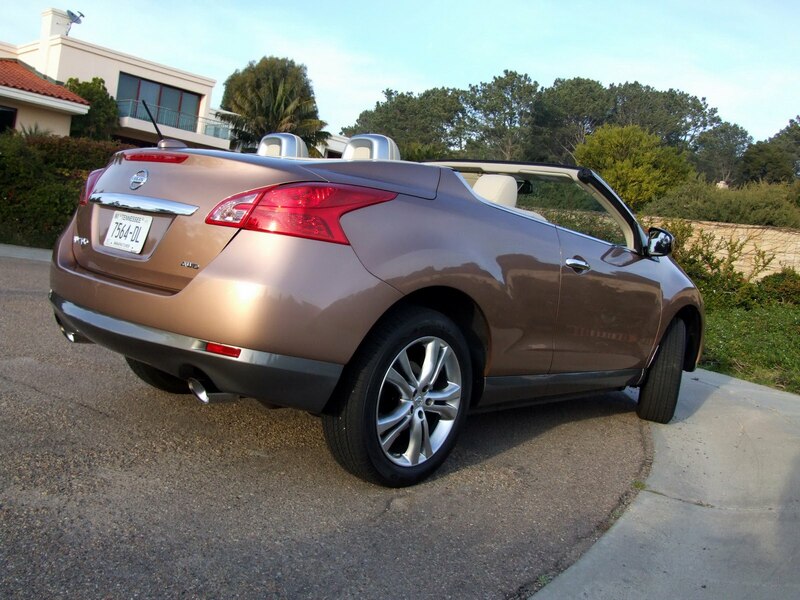 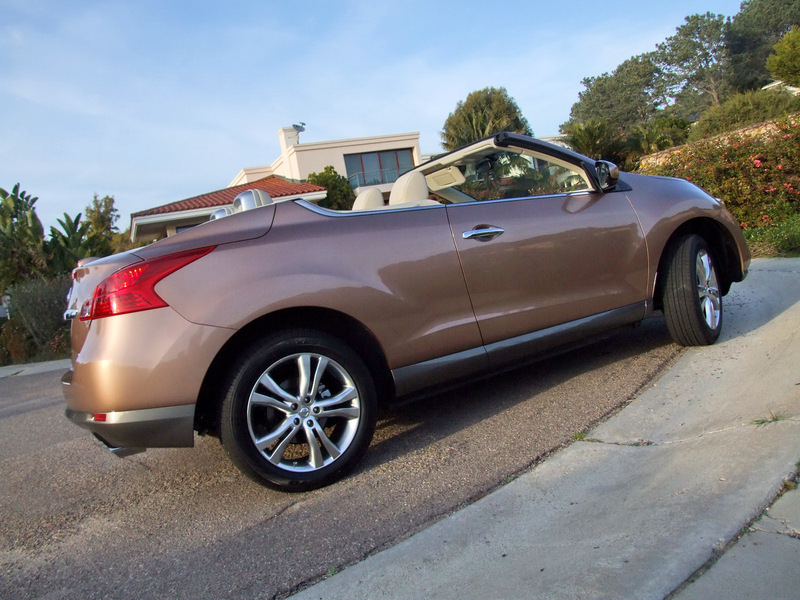 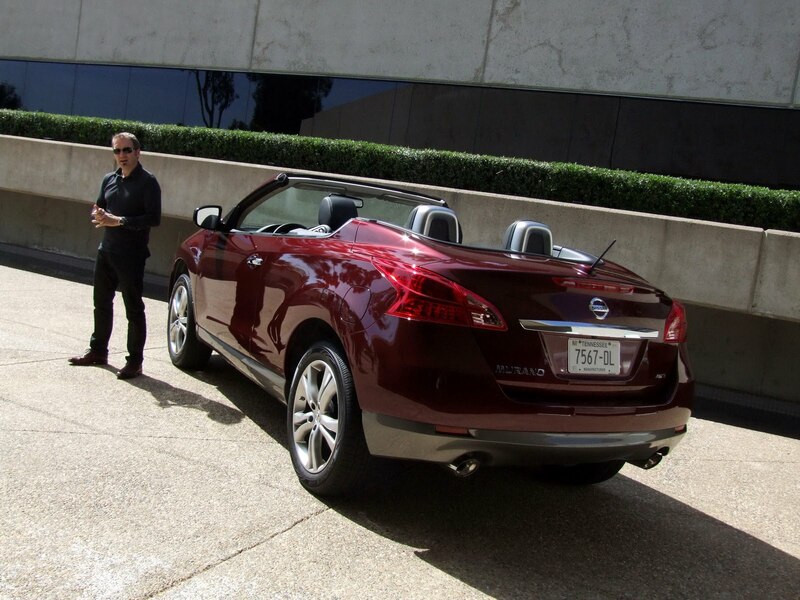 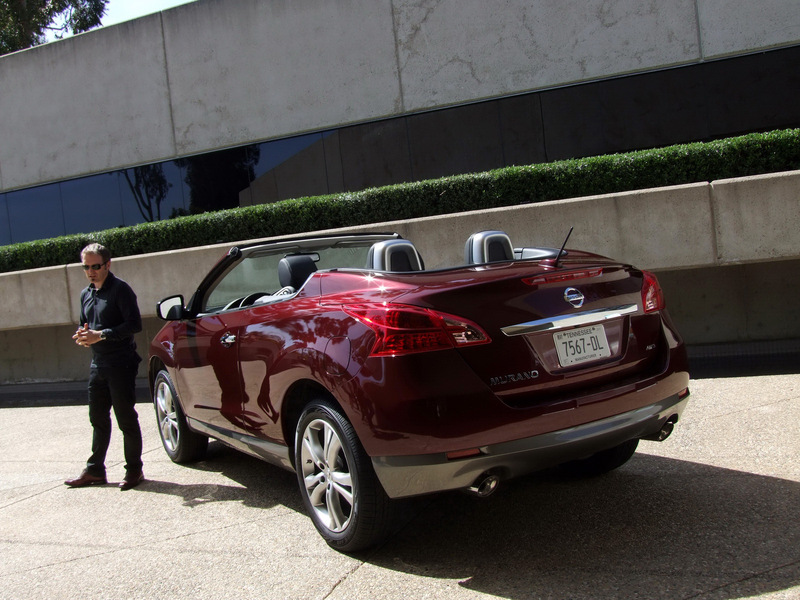 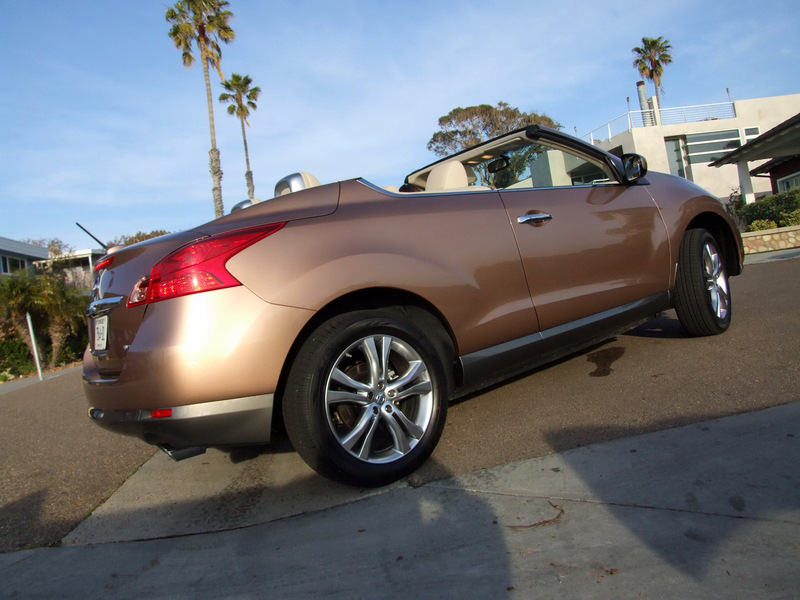 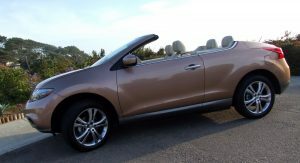 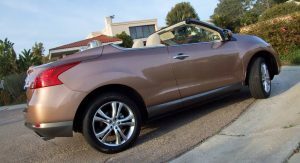 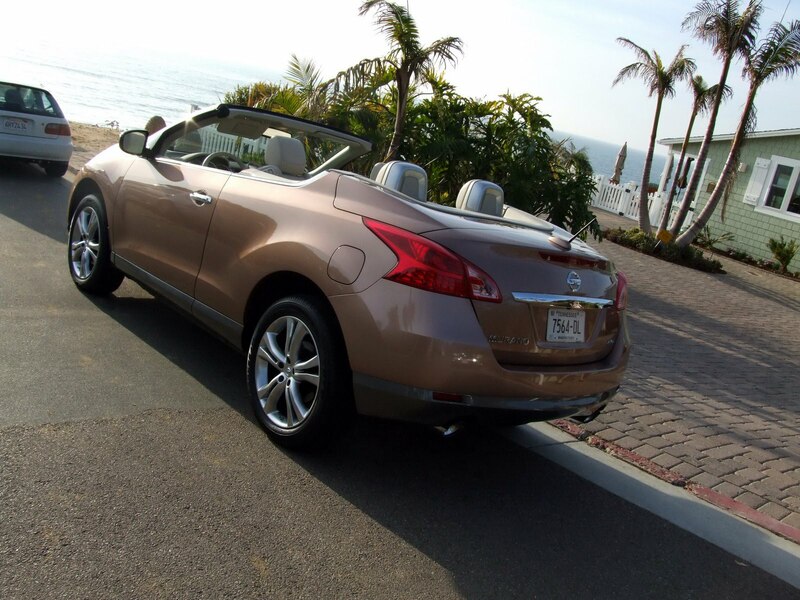 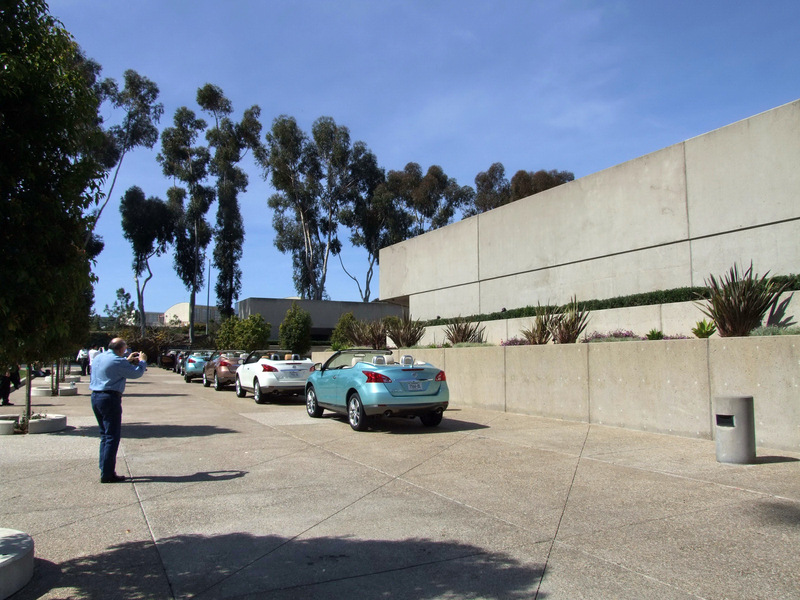 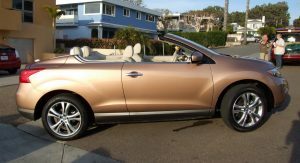 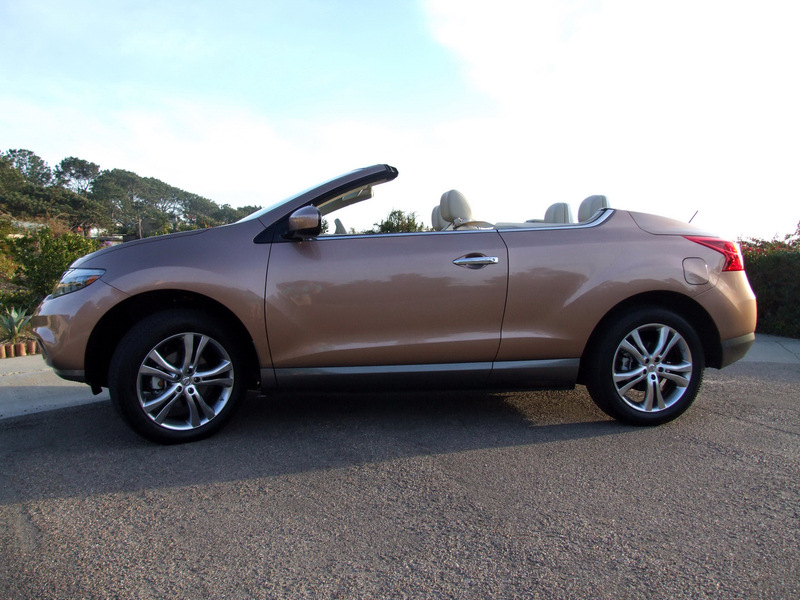 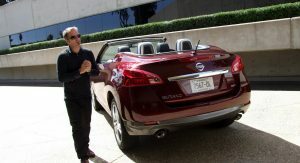 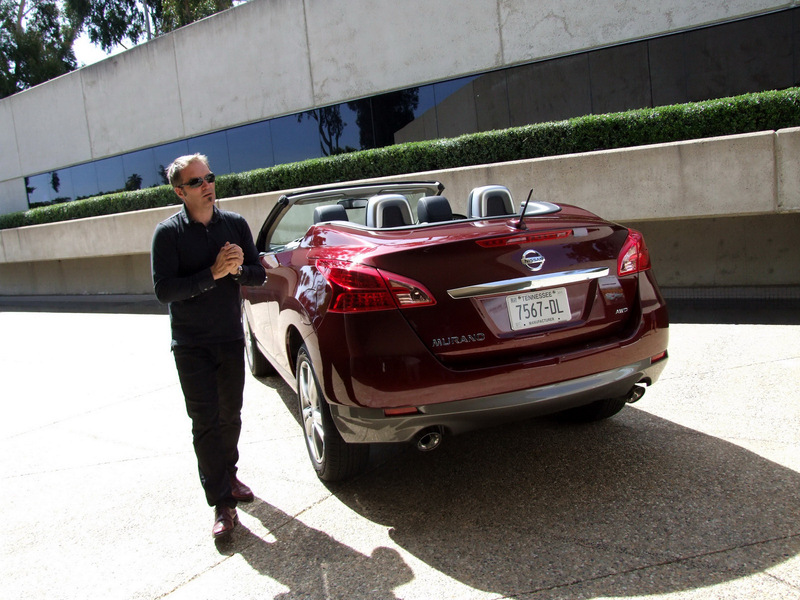 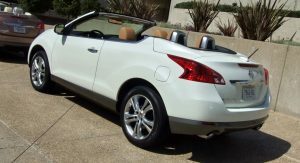 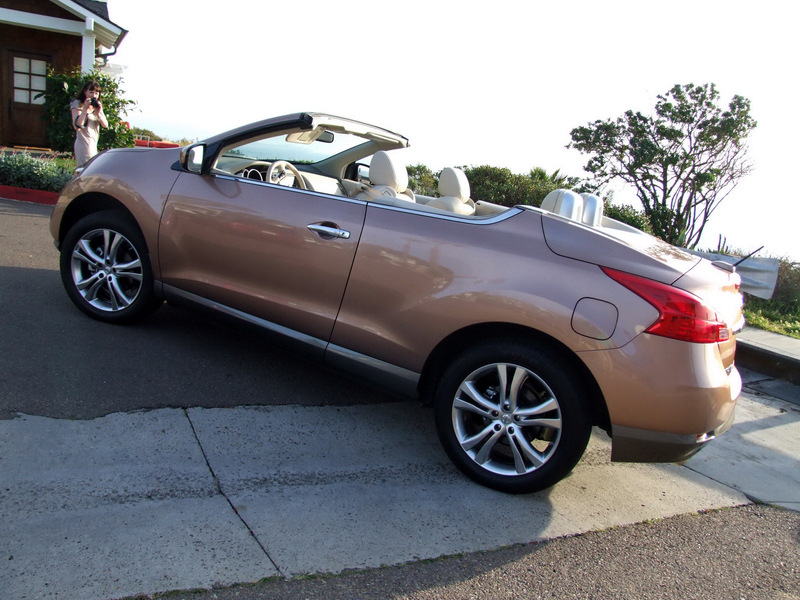 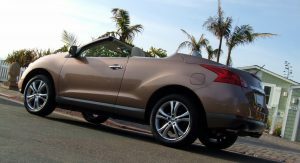 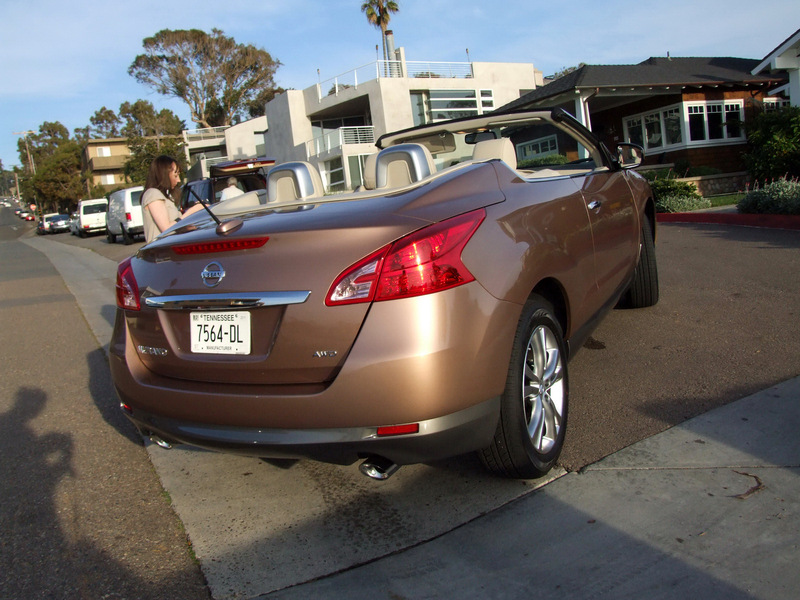 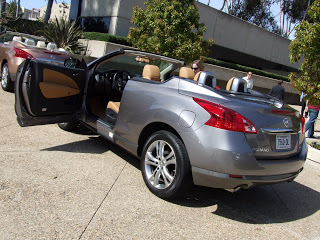 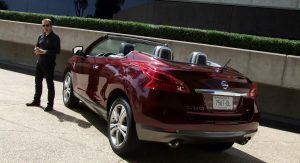 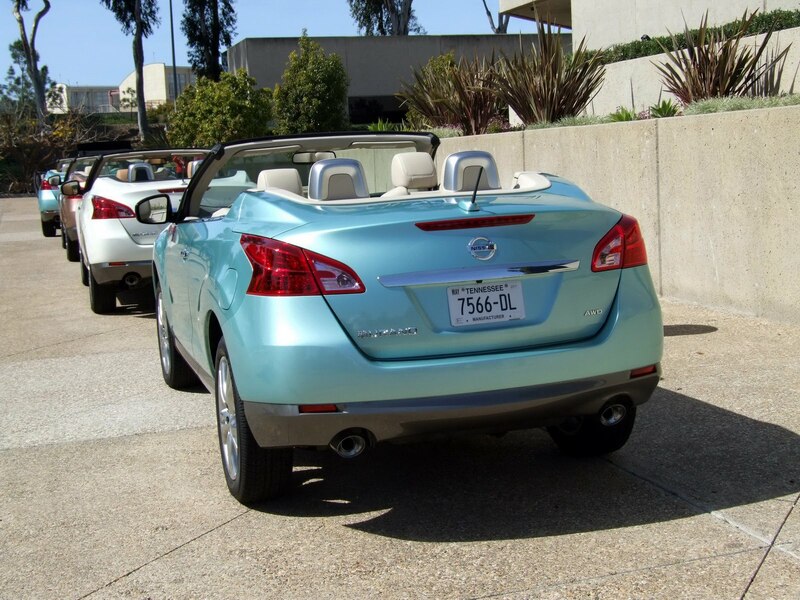 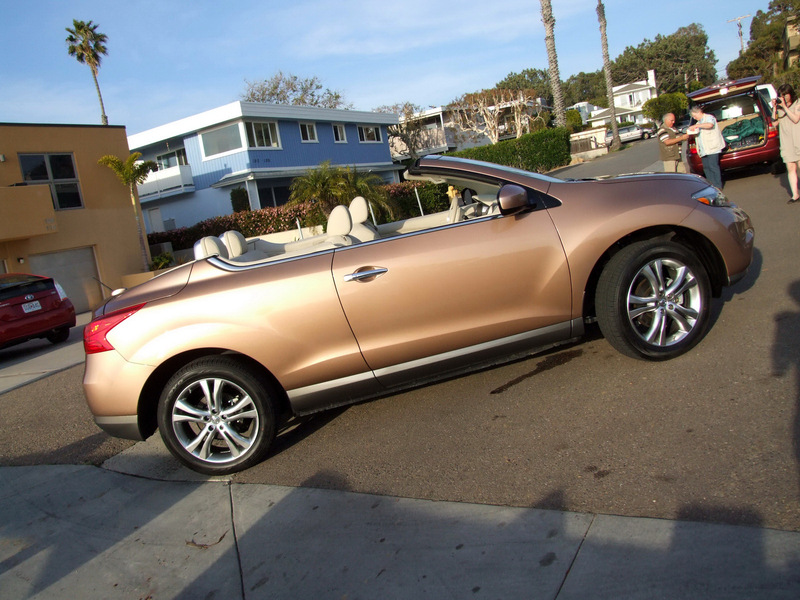 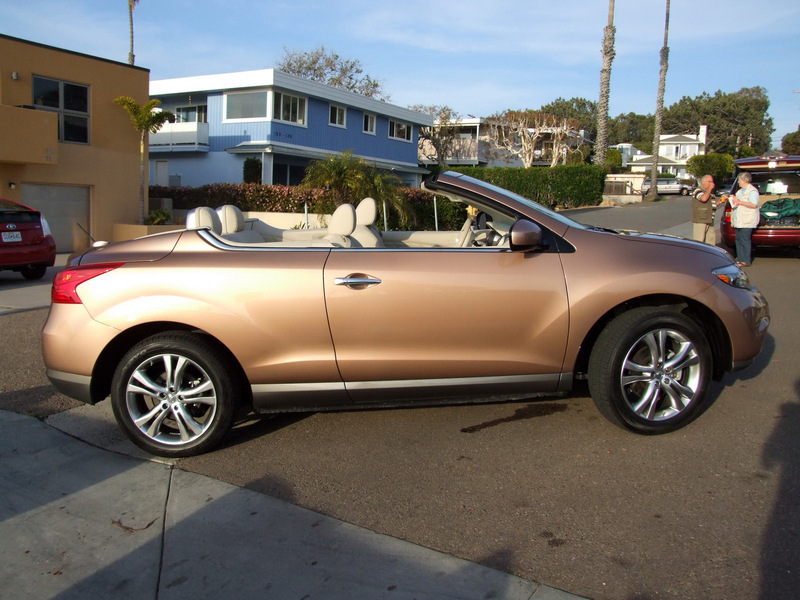 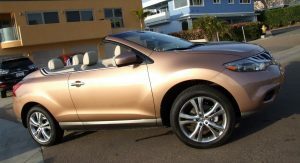 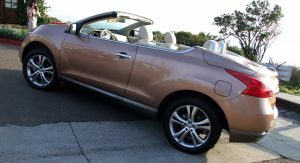 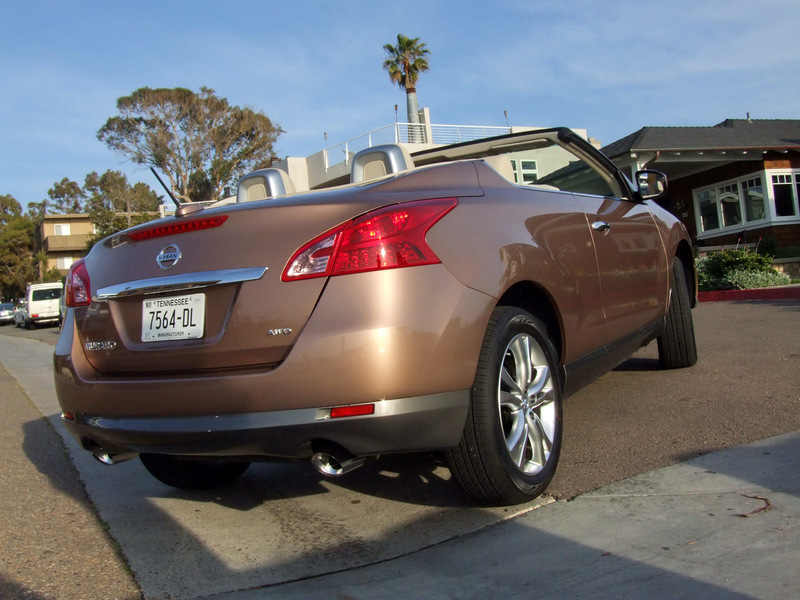 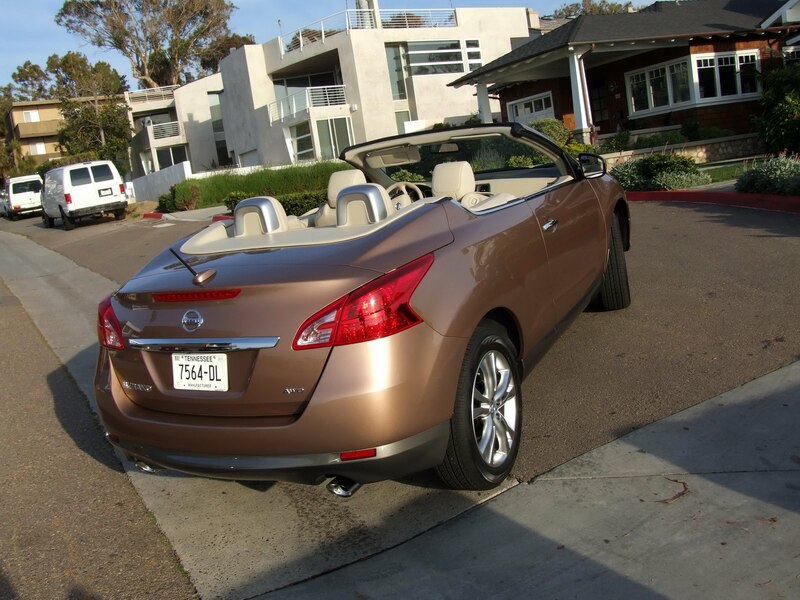 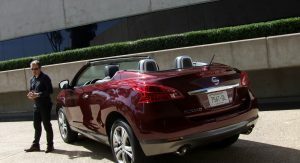 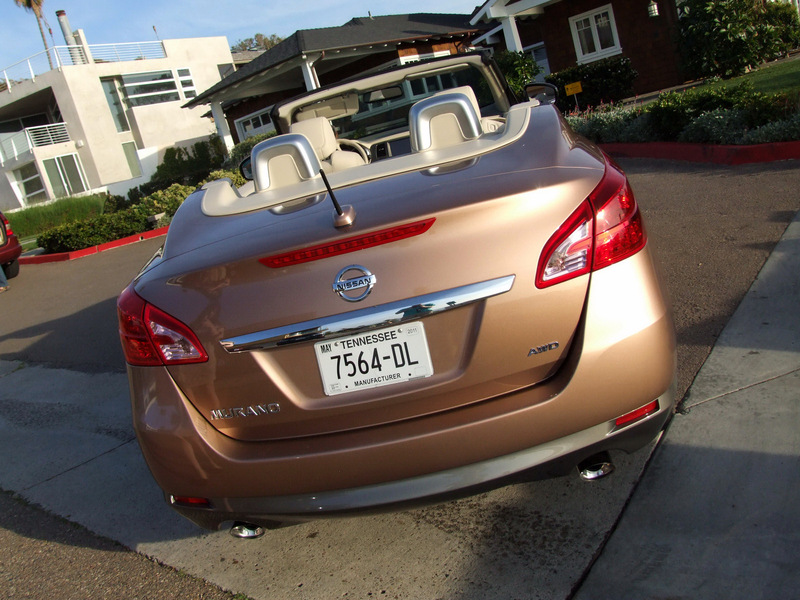 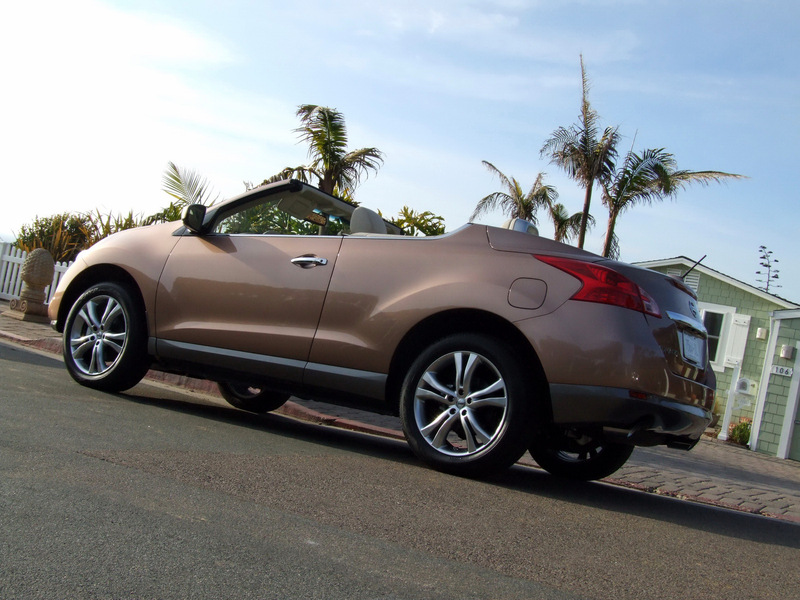 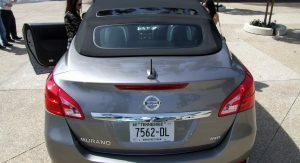 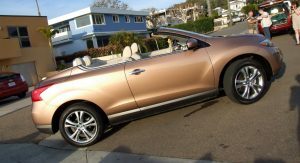 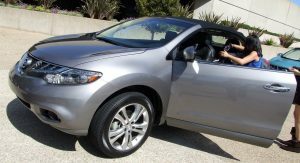 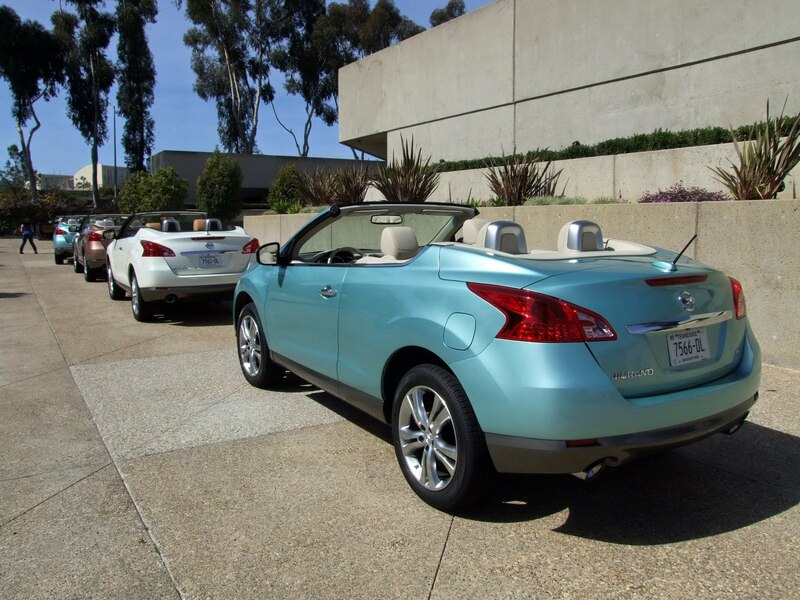 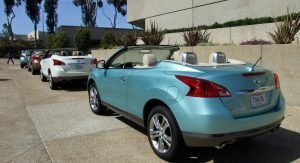 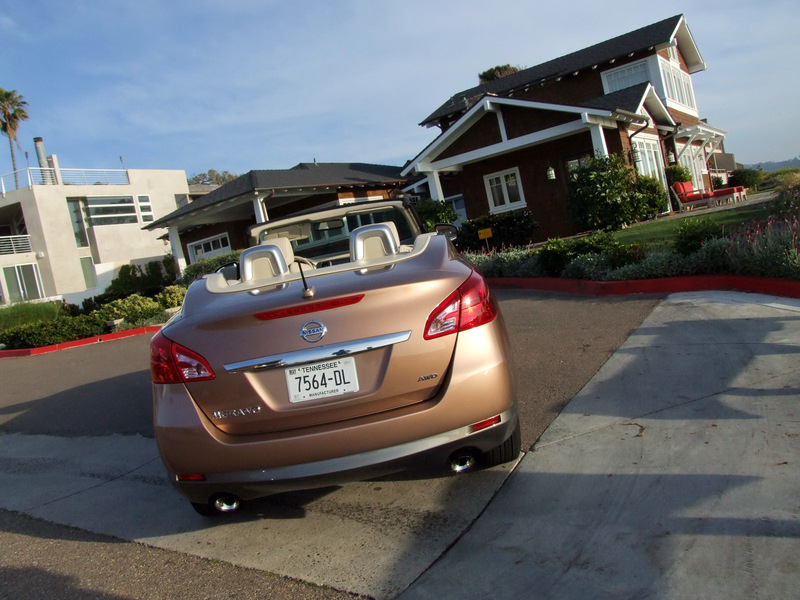 Having been invited out to the seaside town of Del Mar in California for the presentation of the new Murano CrossCabriolet, we were intrigued at the chance to take Nissan’s polarizing convertible out for a spin. 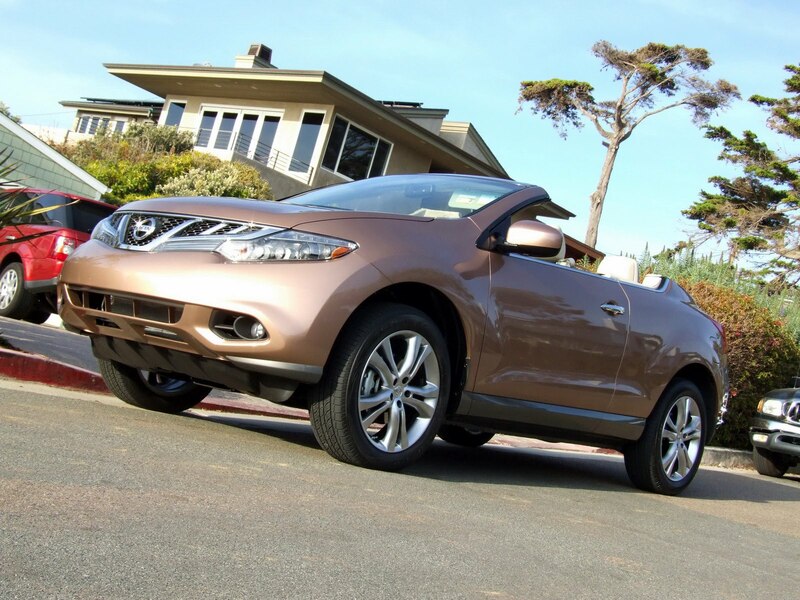 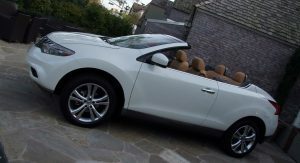 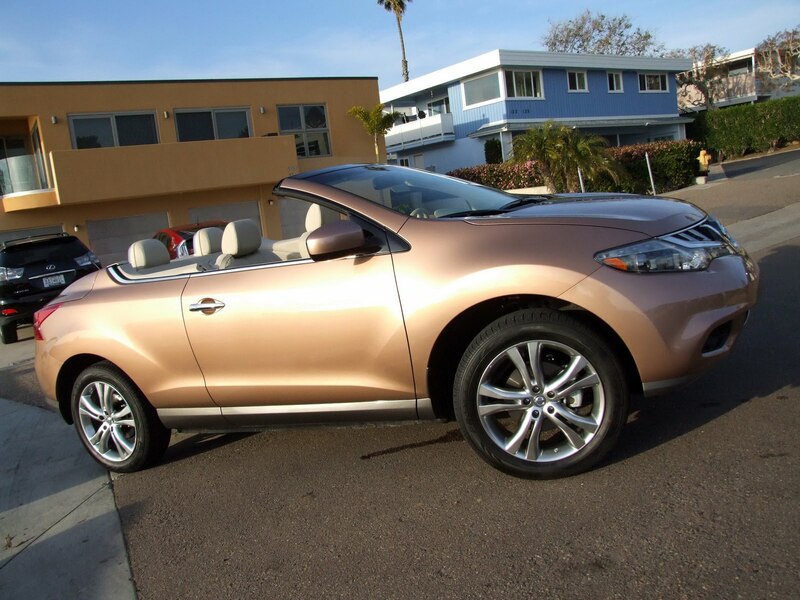 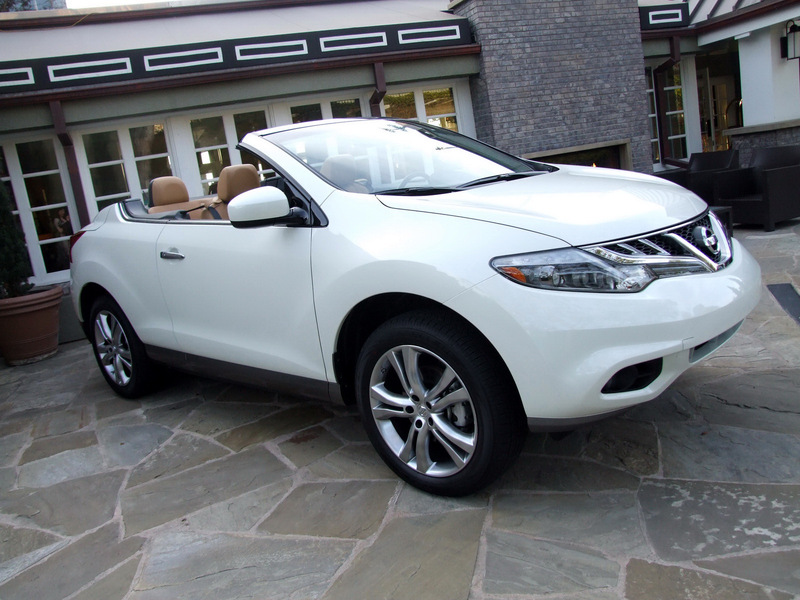 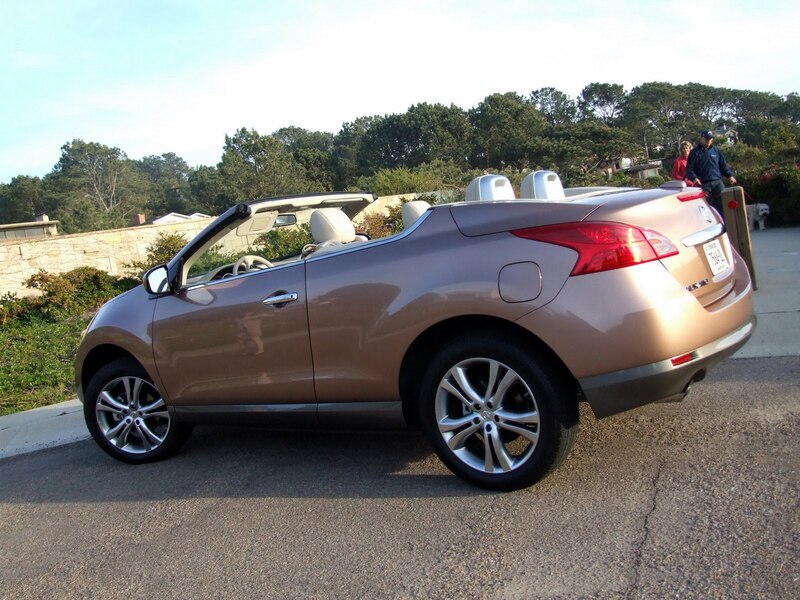 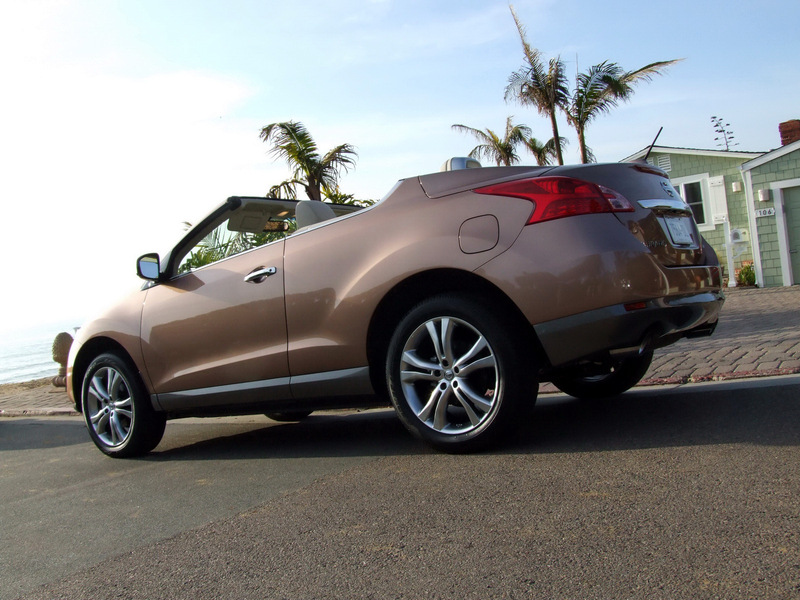 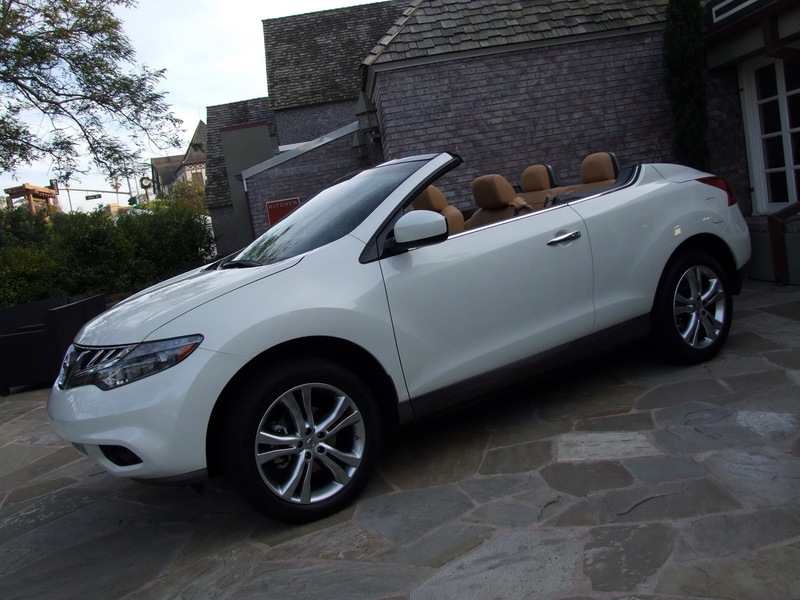 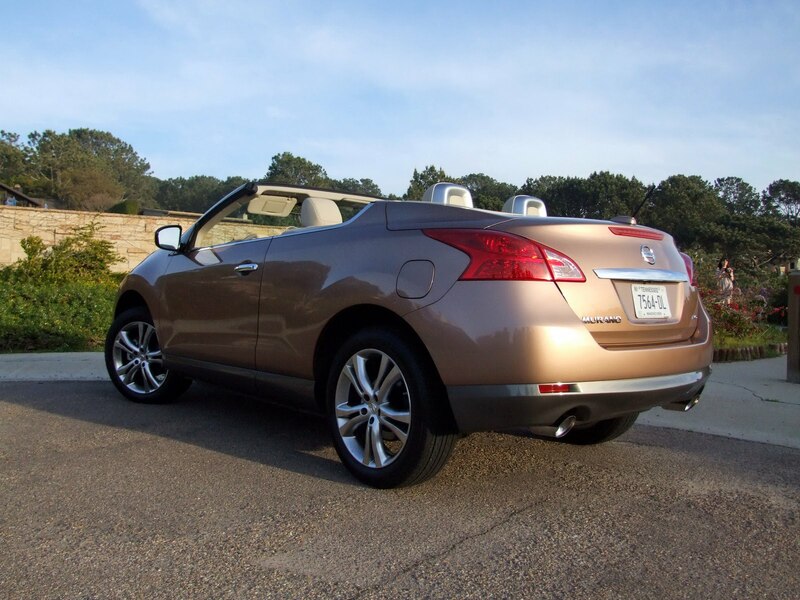 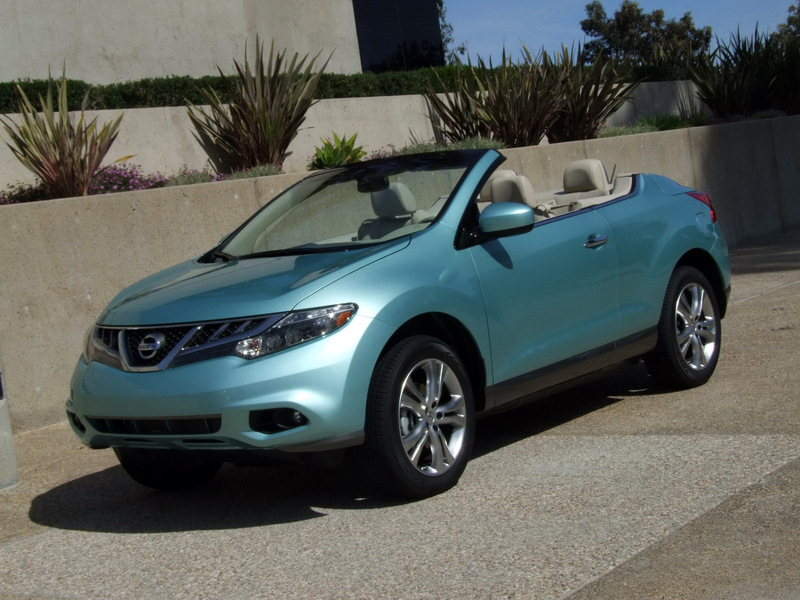 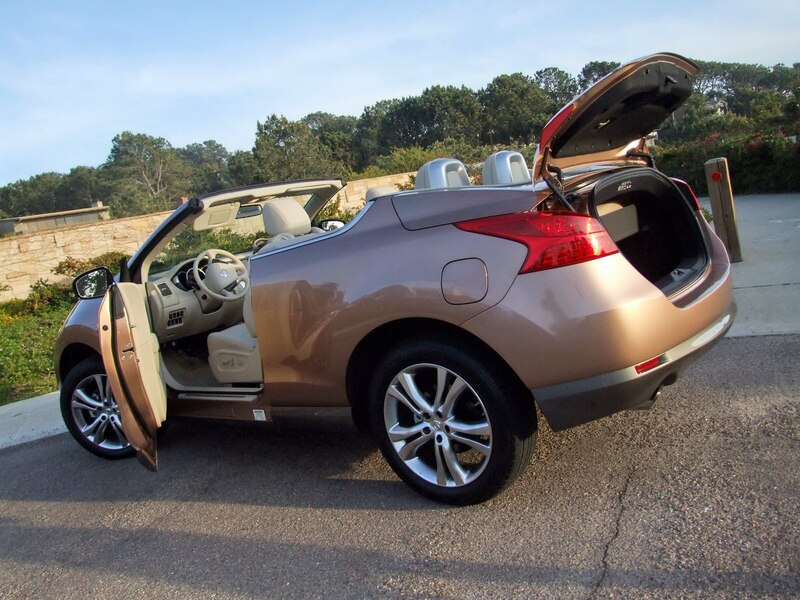 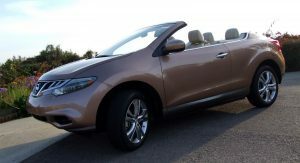 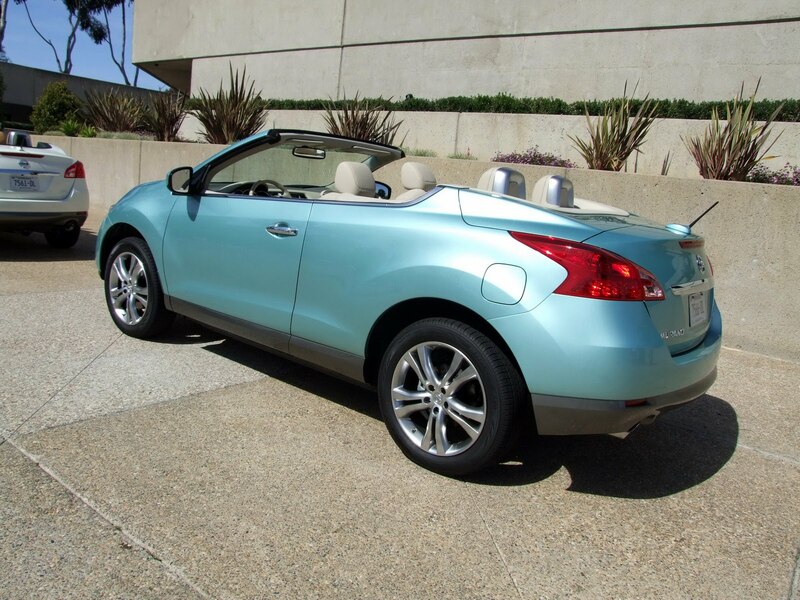 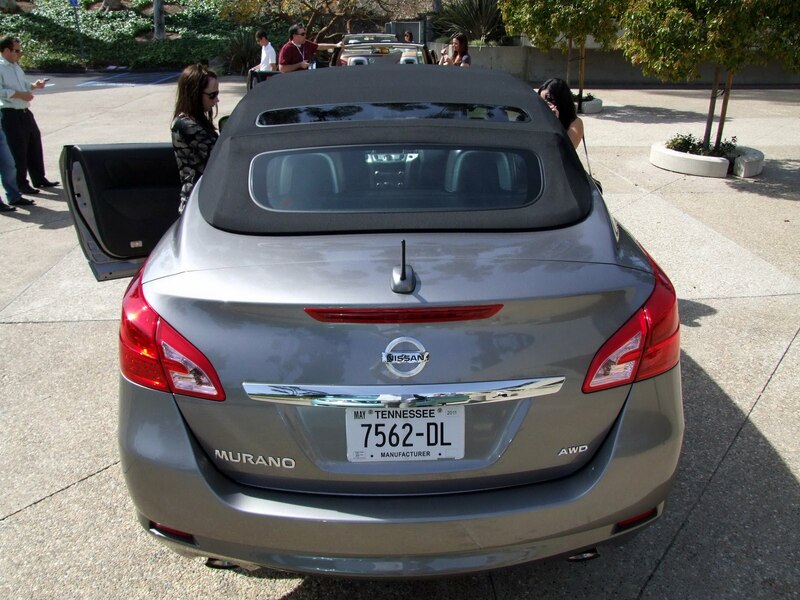 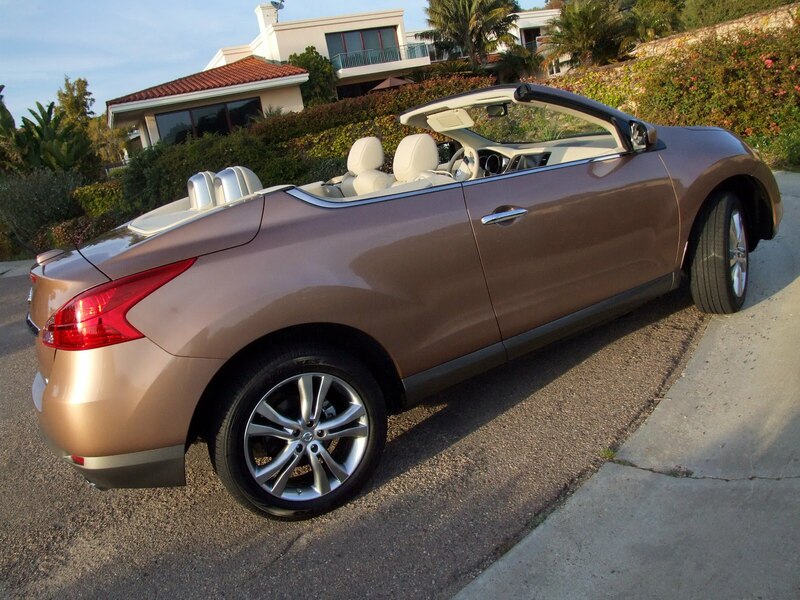 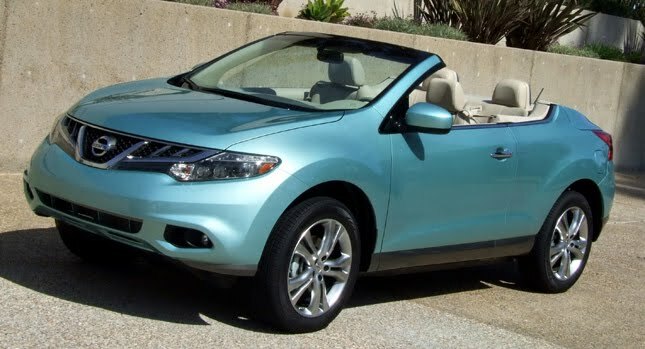 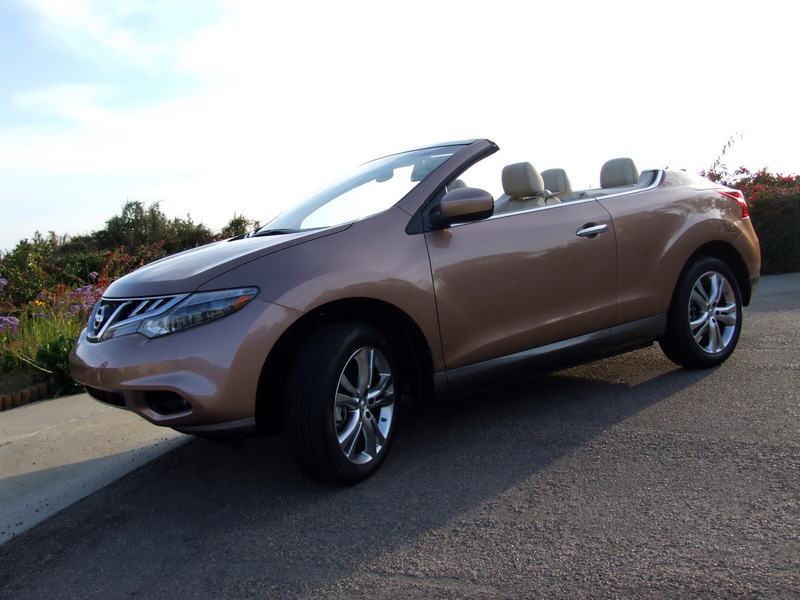 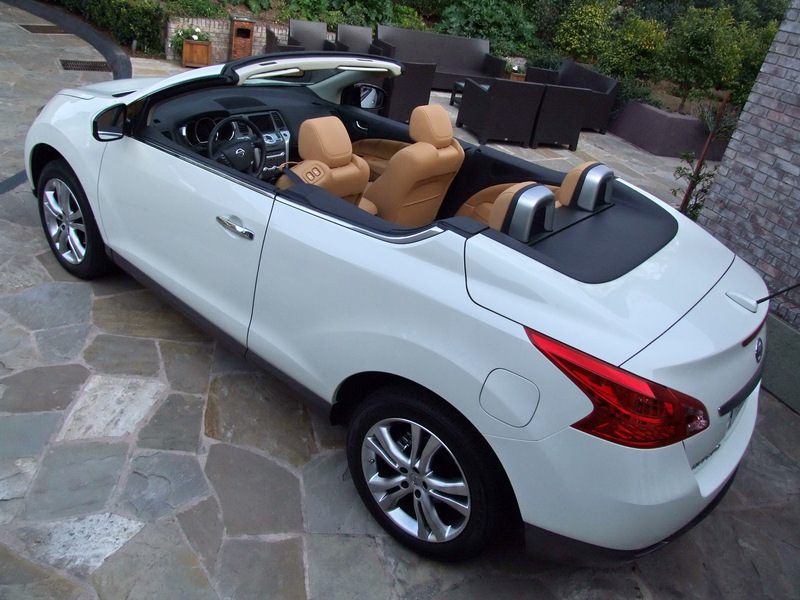 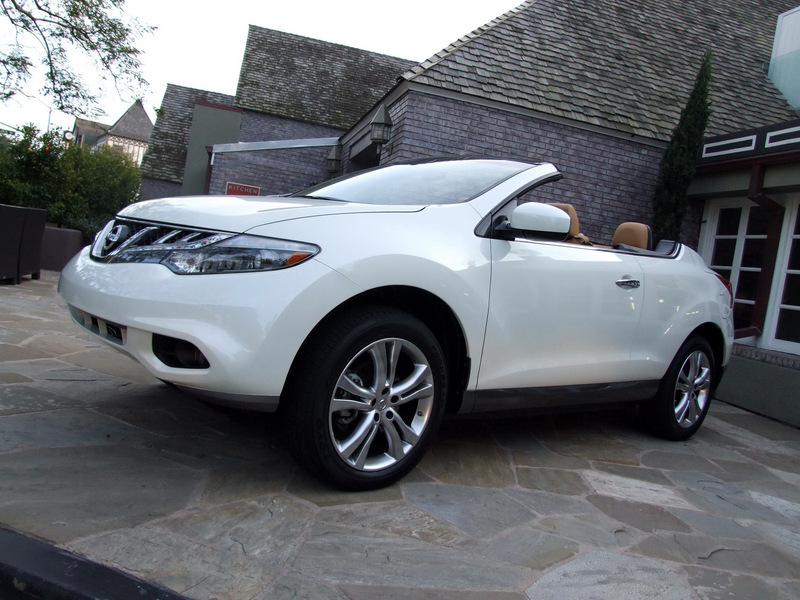 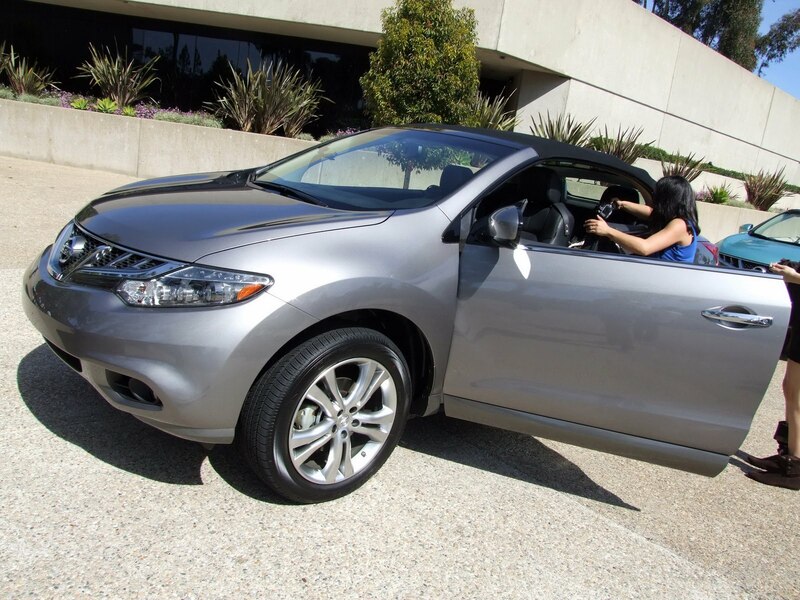 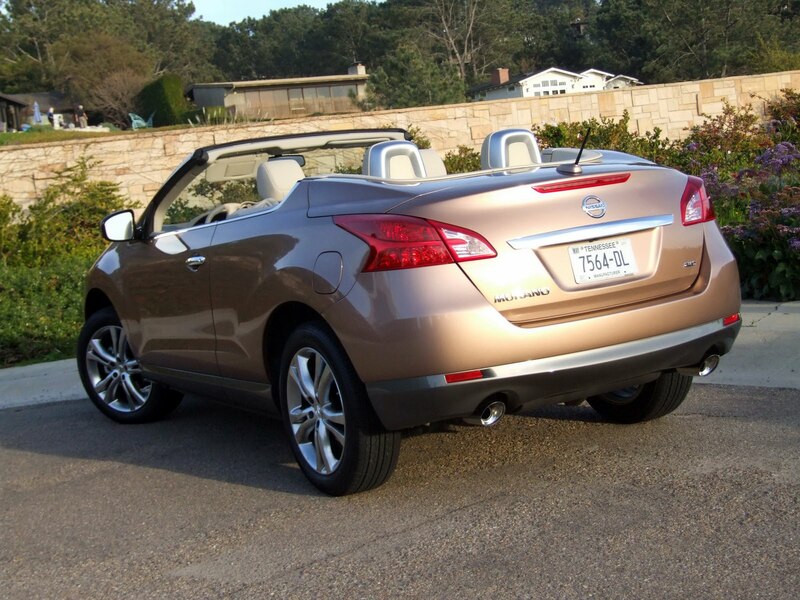 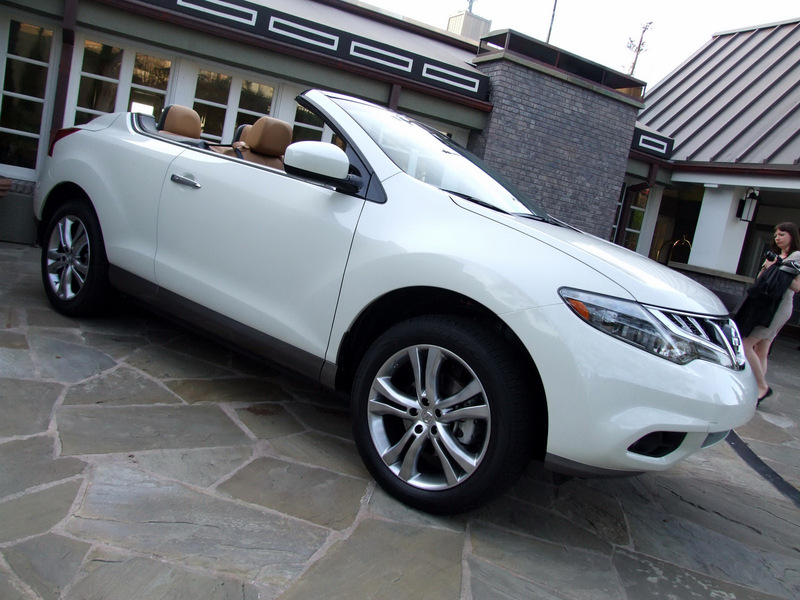 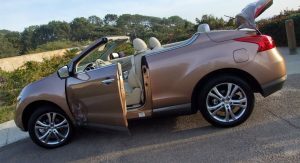 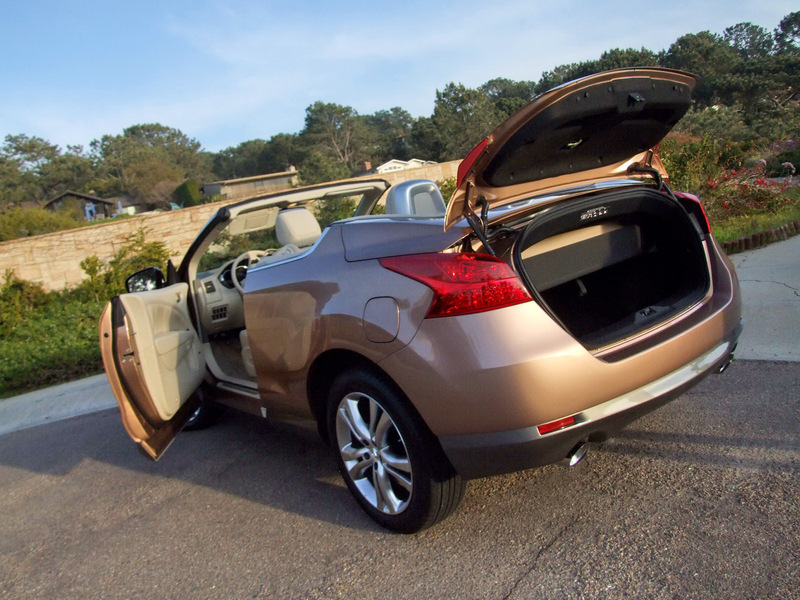 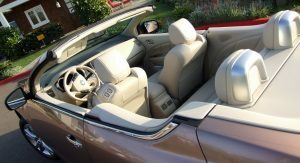 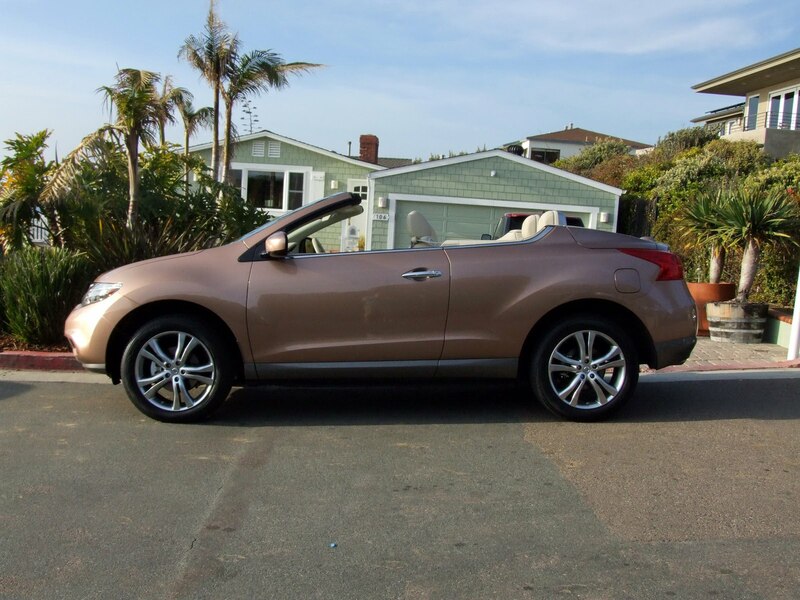 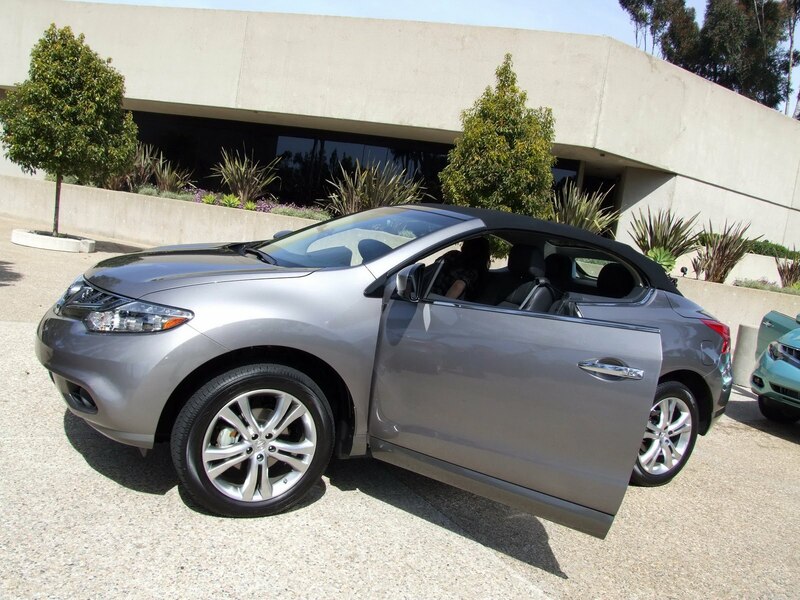 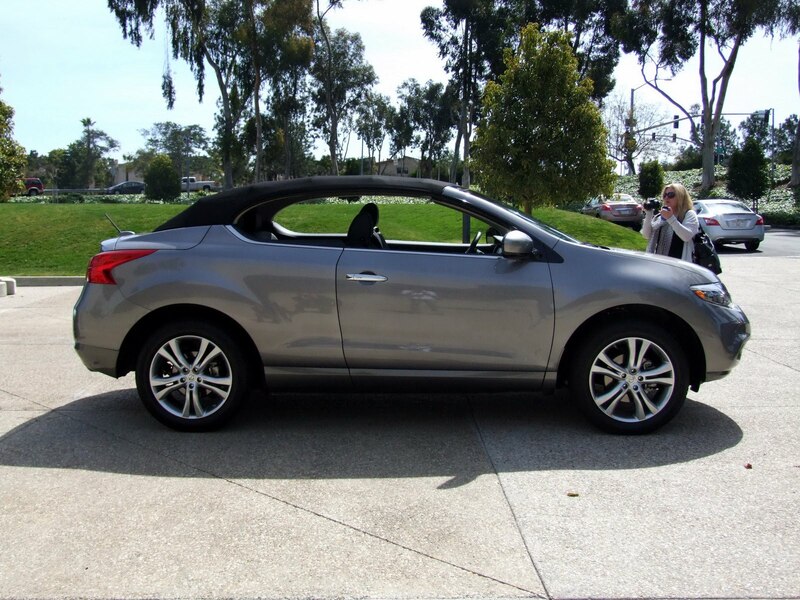 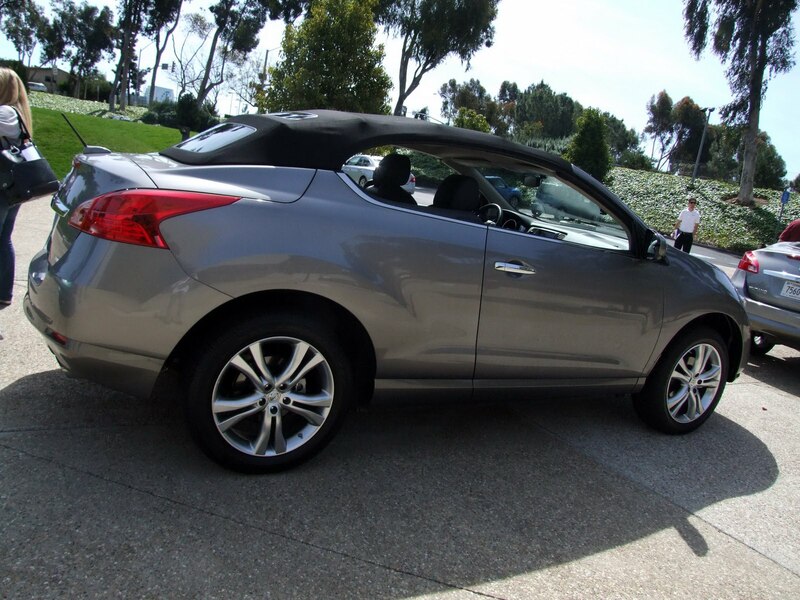 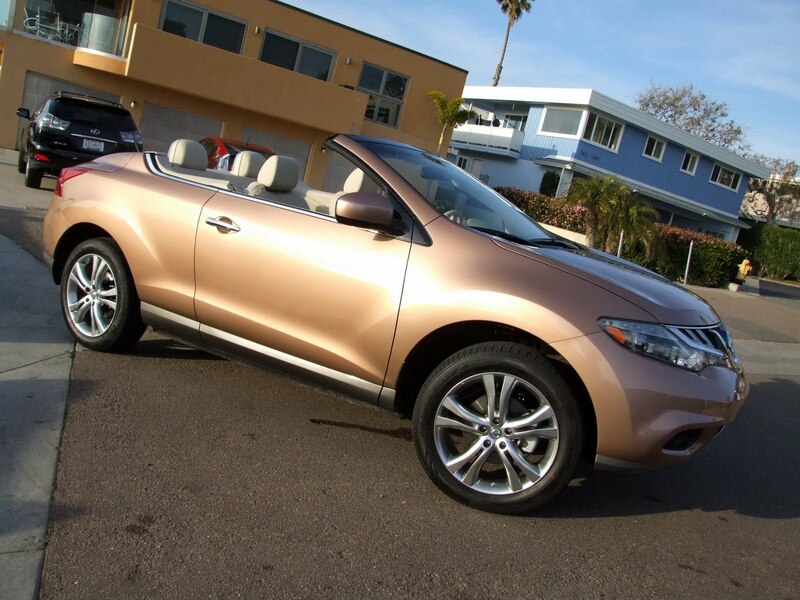 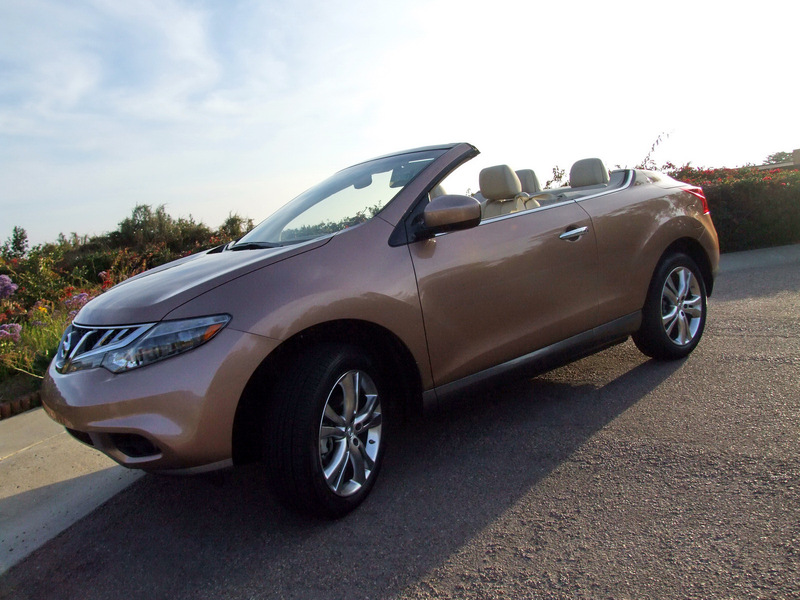 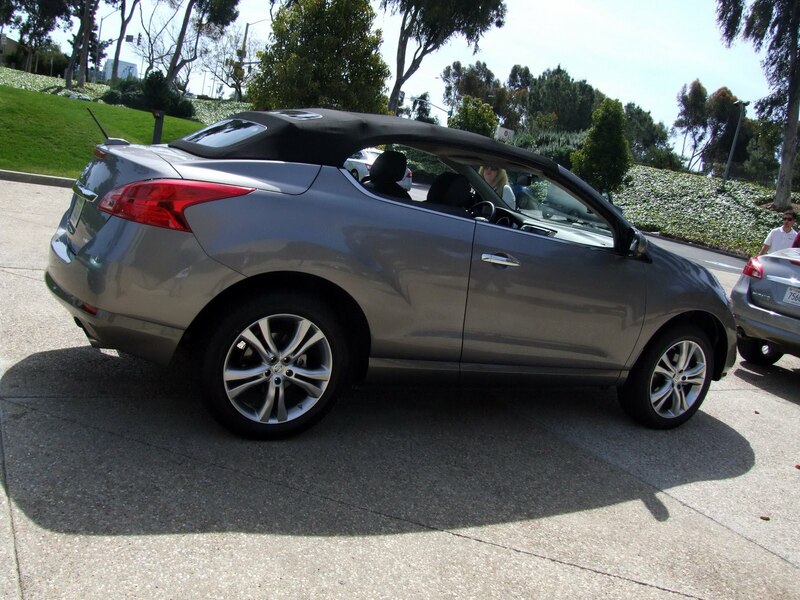 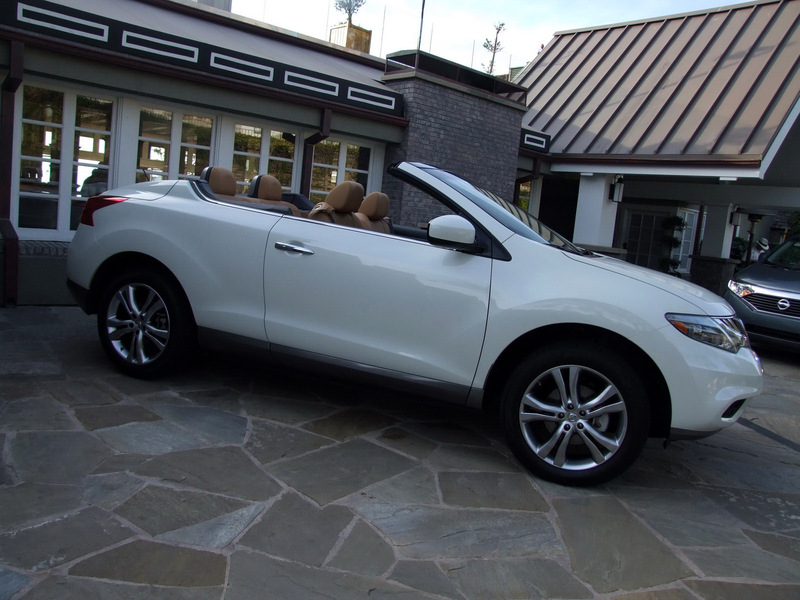 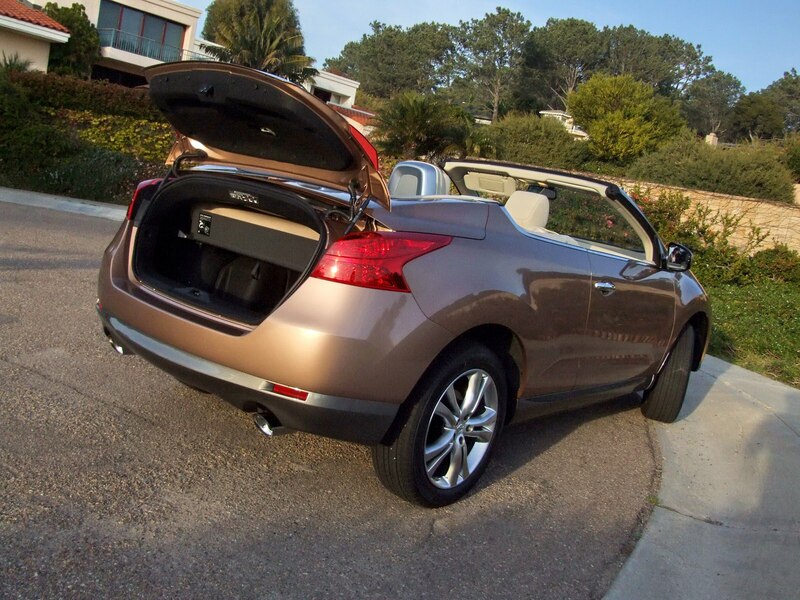 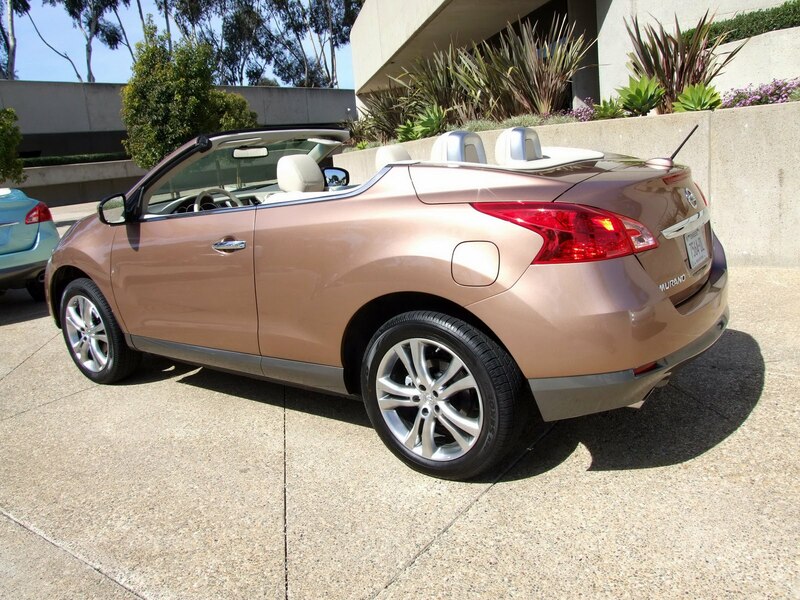 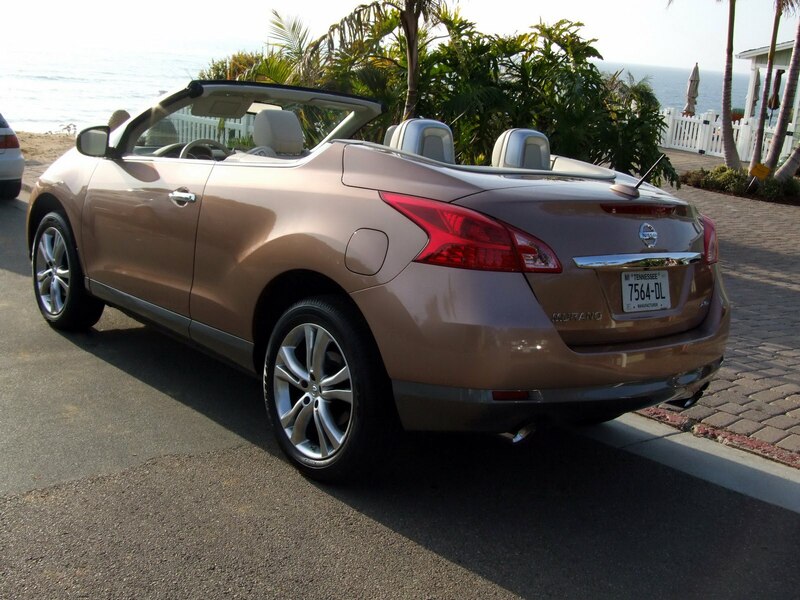 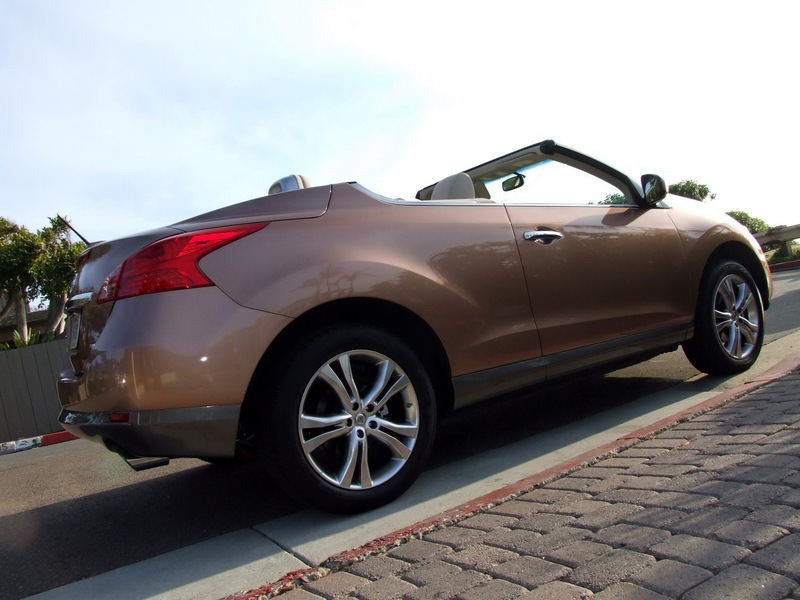 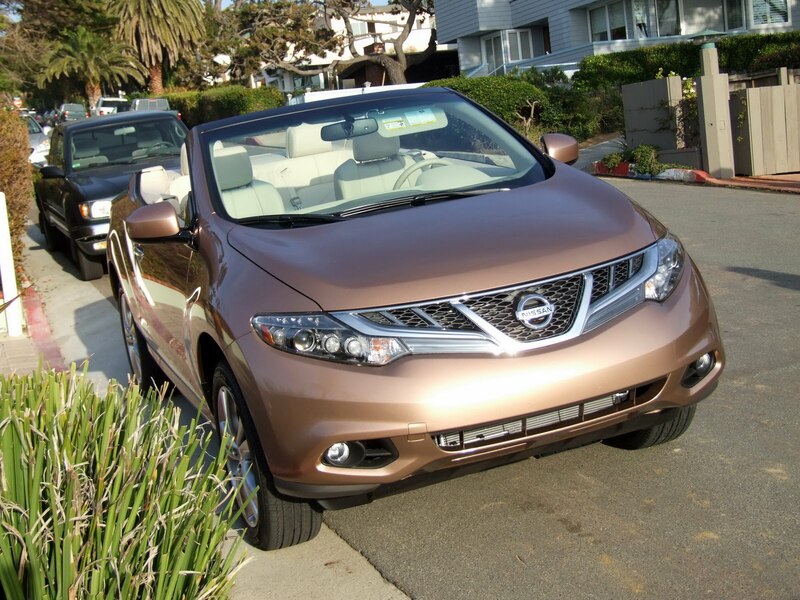 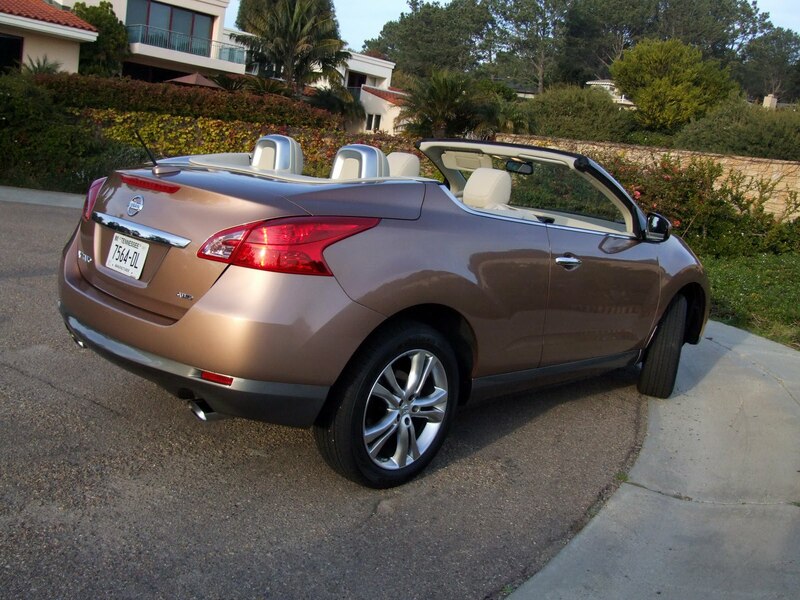 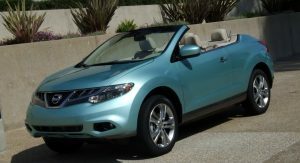 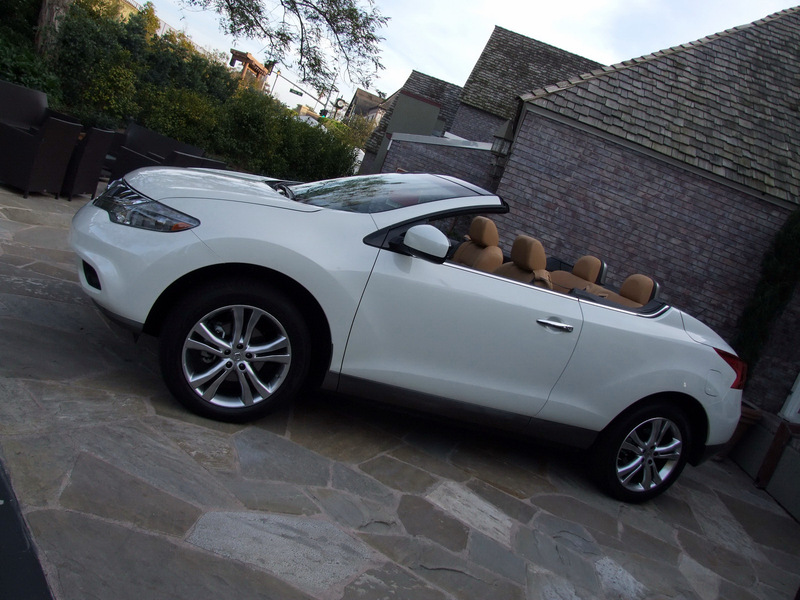 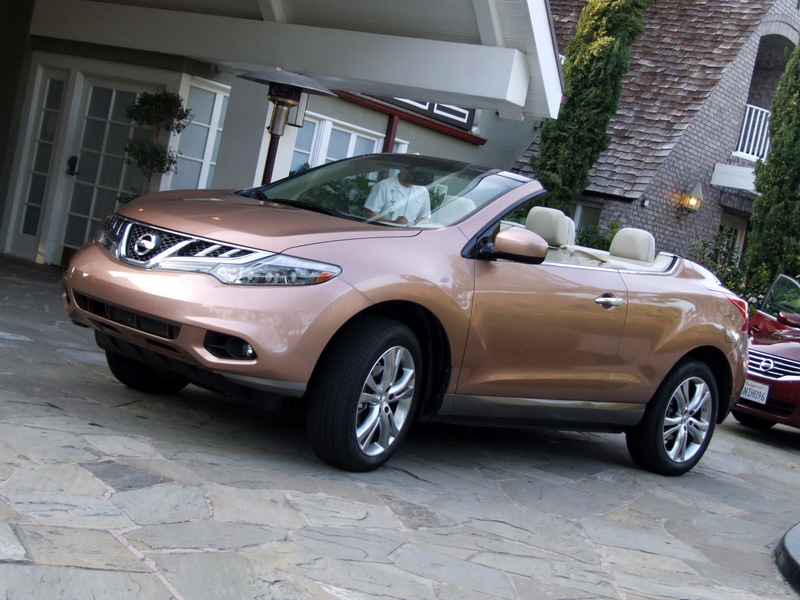 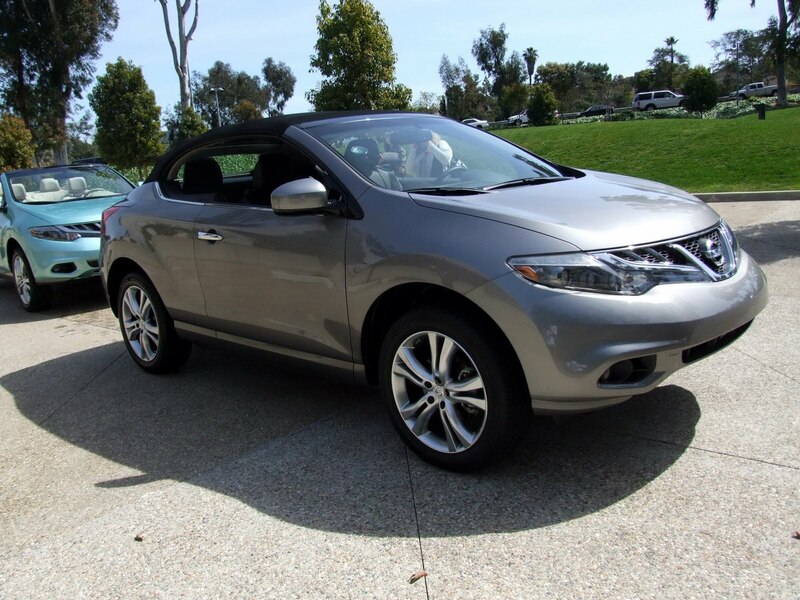 That’s right, the Murano convertible. 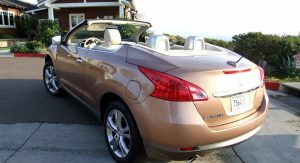 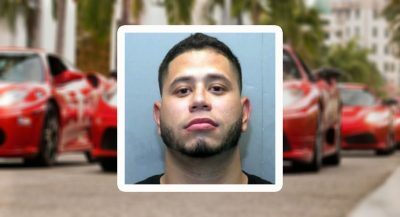 How did things play out in California? 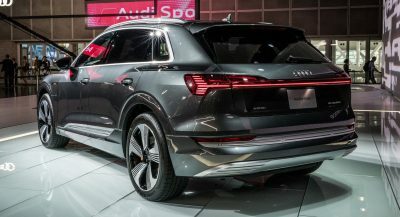 Interesting, to say the least. 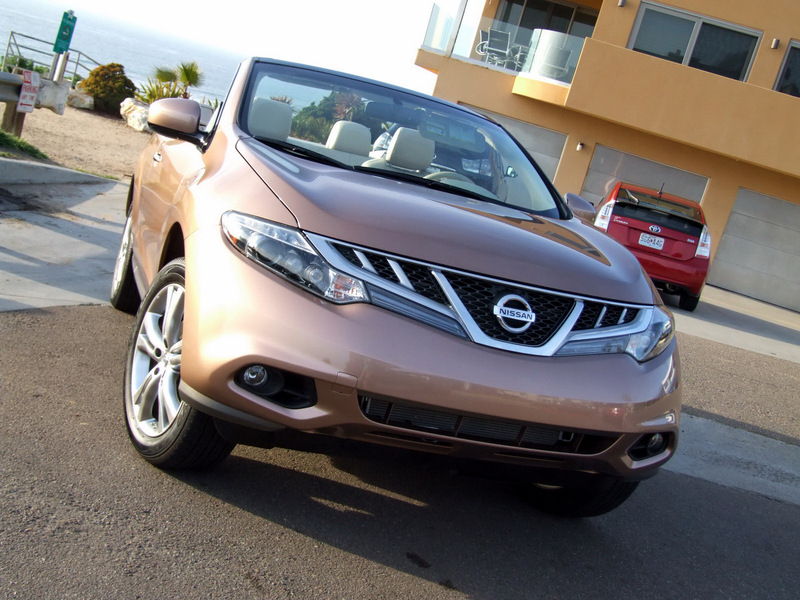 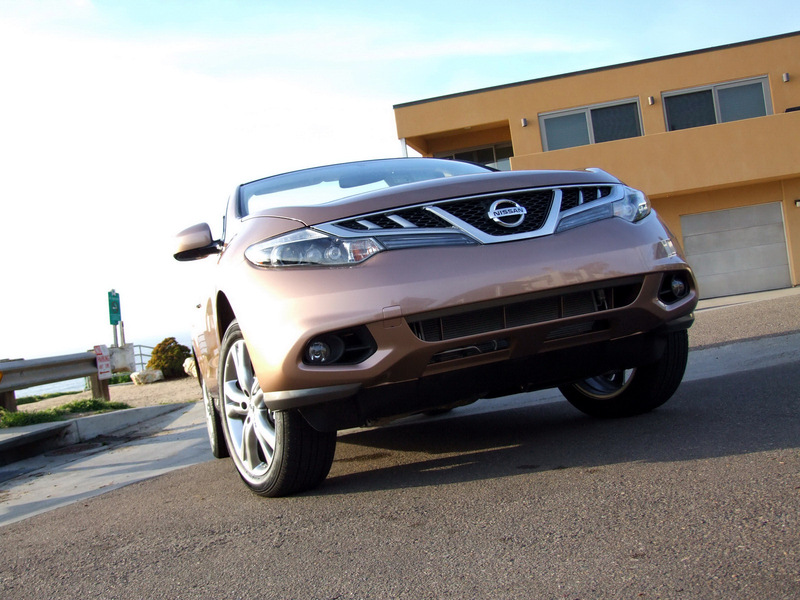 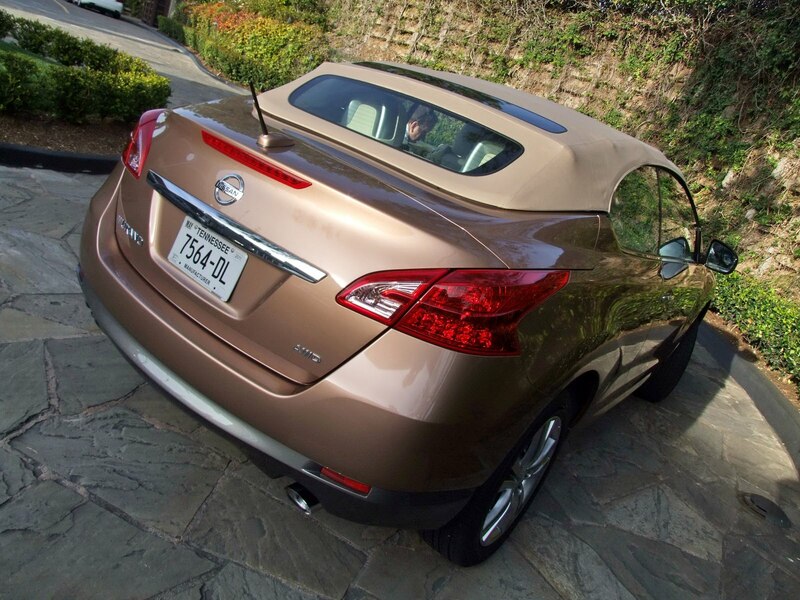 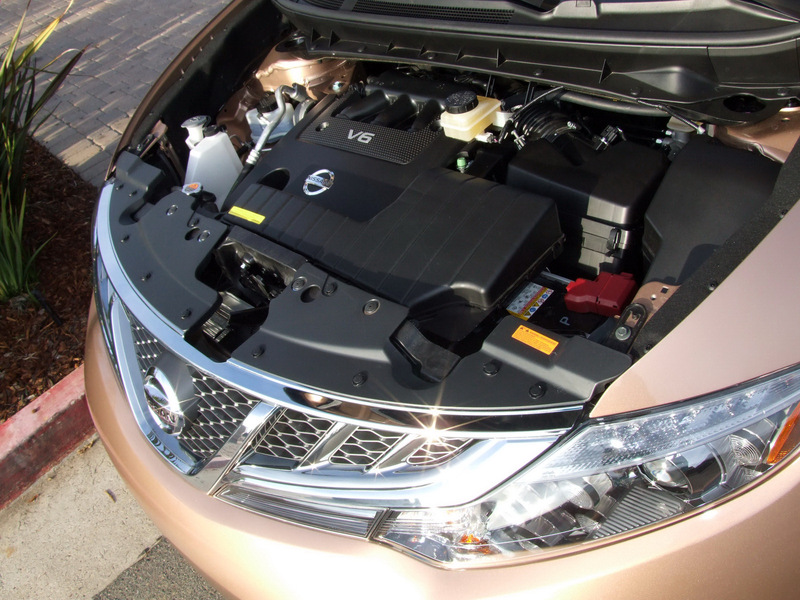 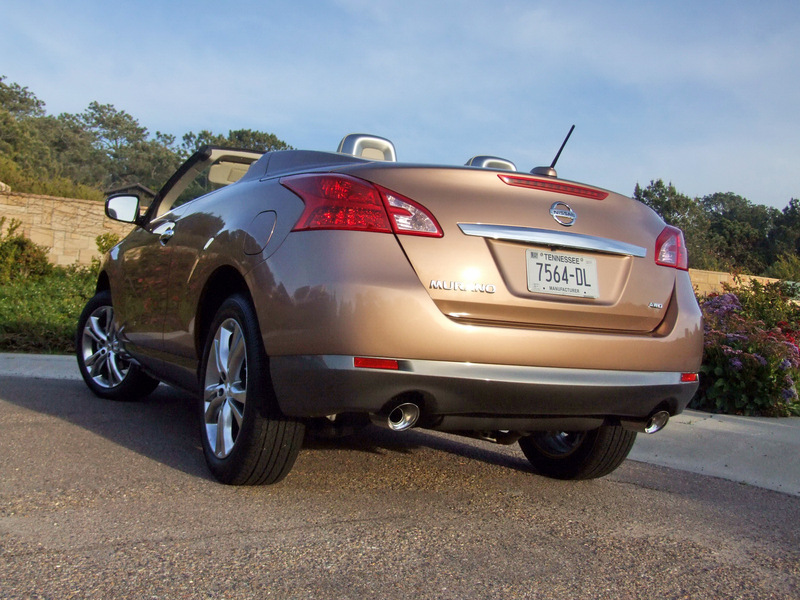 With the Murano CC, Nissan has gone outside the box to create its own niche. 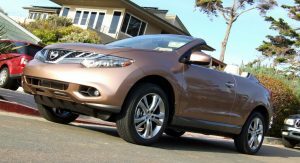 Looks aside, the Murano CC has done what it set out to do: garner interest, spur conversation, expand the model range, and change (not necessarily raise) the bar for mid-size crossovers. 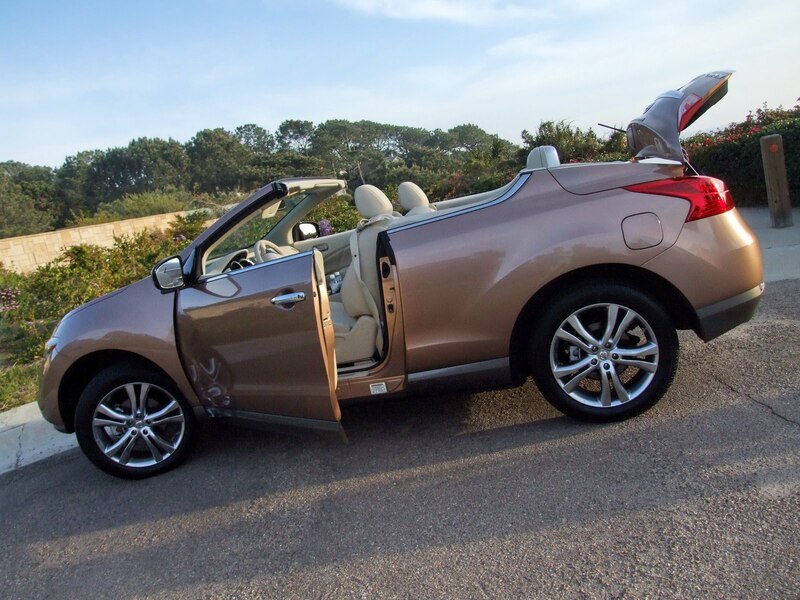 For all the ups and downs, read on. 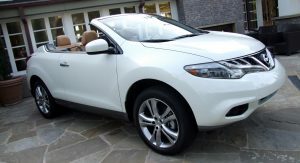 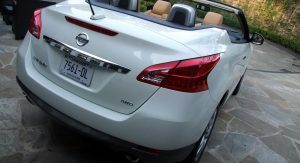 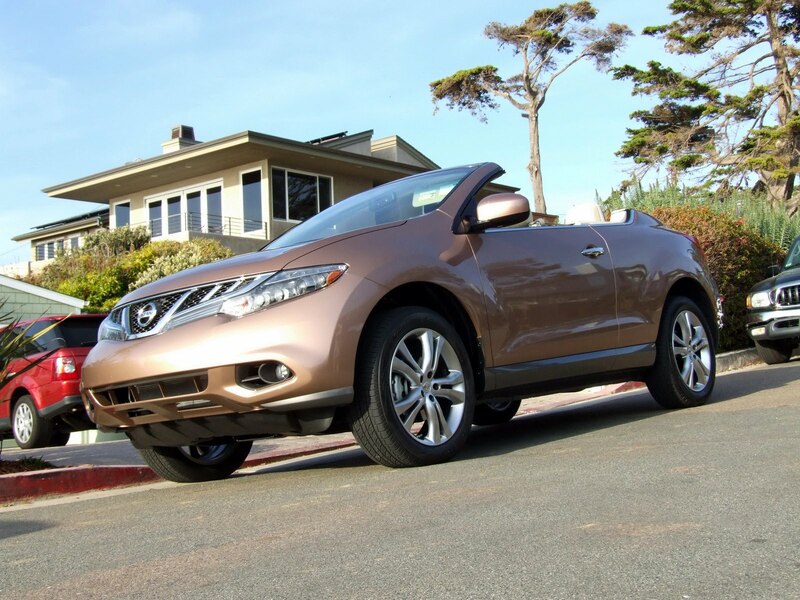 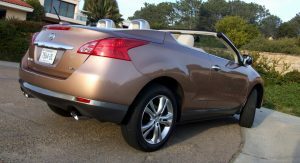 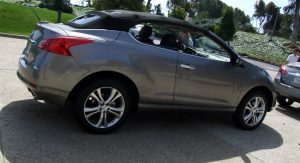 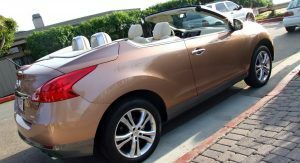 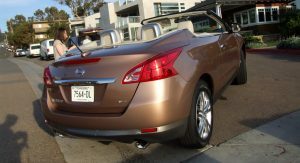 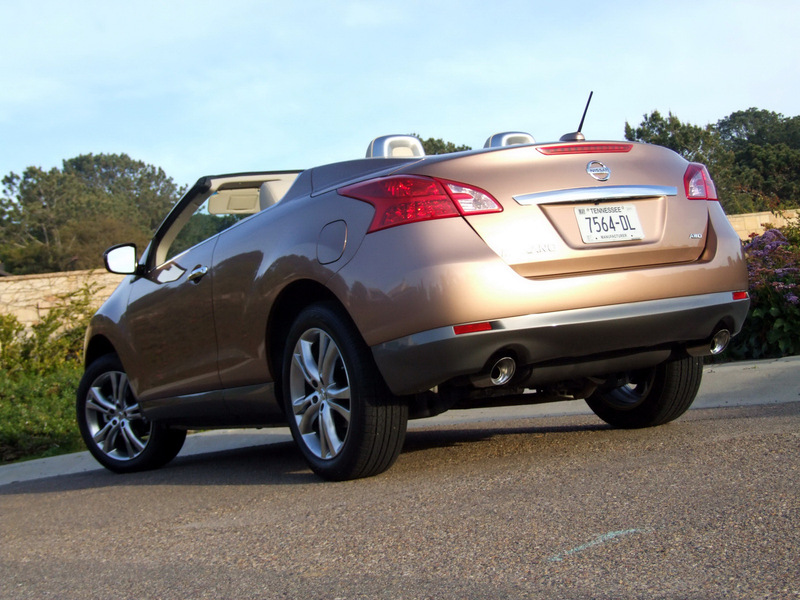 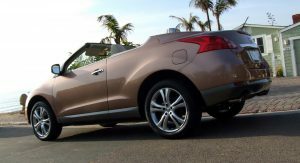 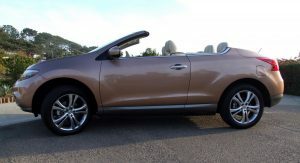 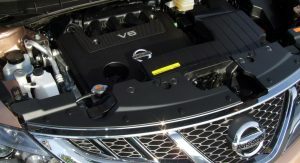 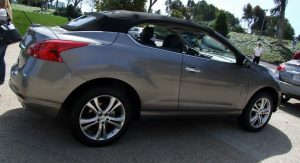 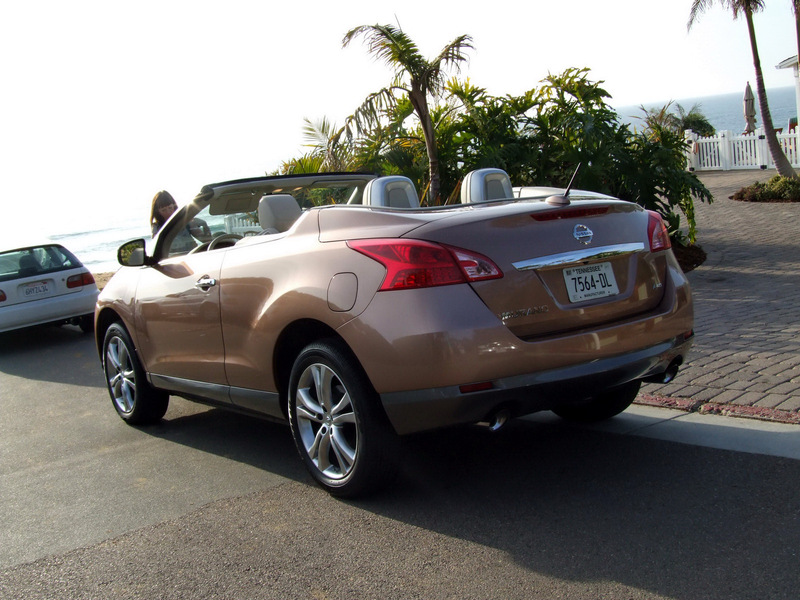 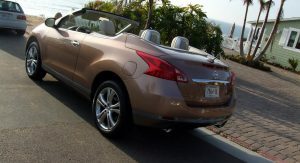 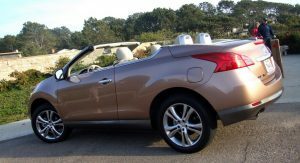 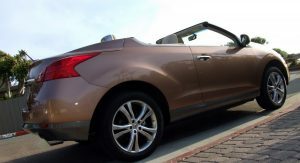 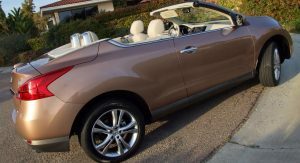 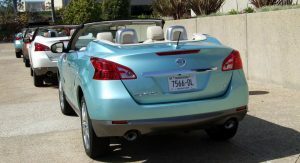 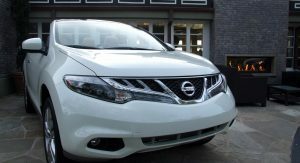 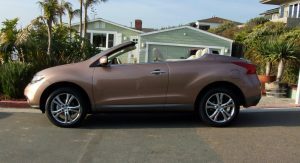 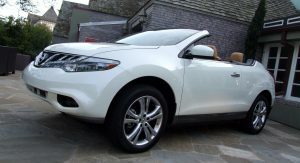 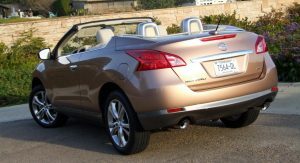 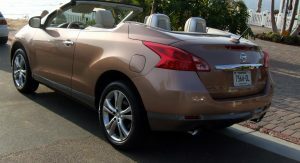 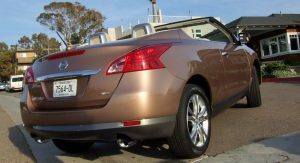 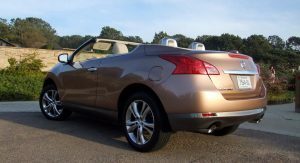 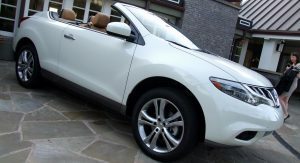 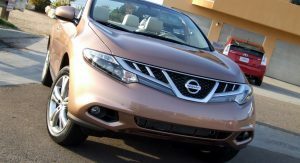 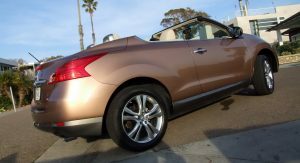 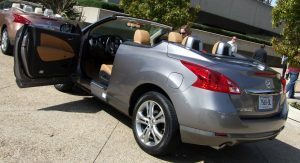 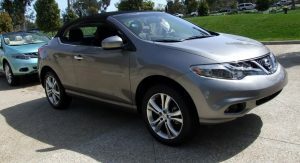 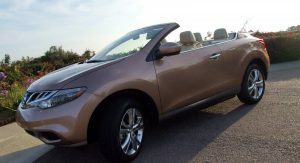 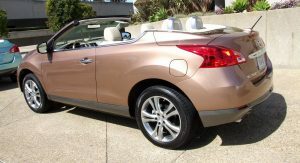 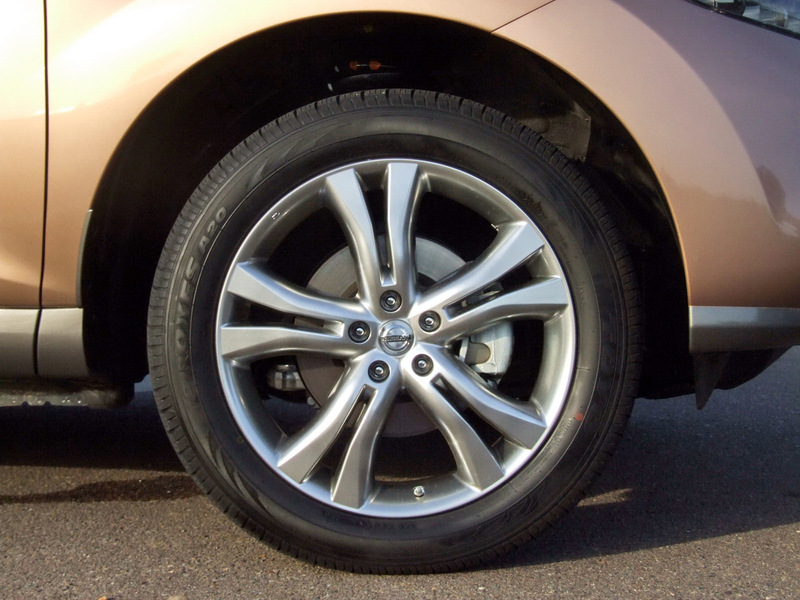 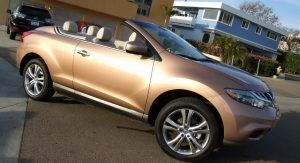 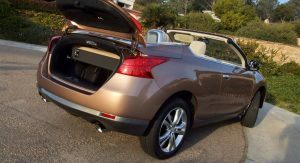 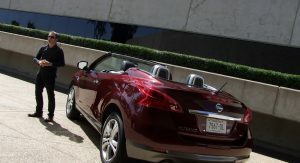 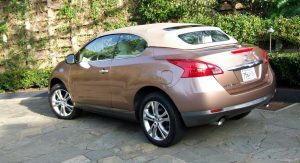 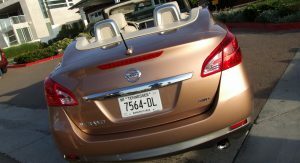 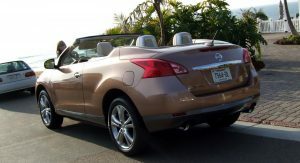 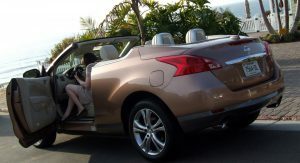 Nissan’s Murano CC is a two-door convertible crossover that sits at the top of the Murano heap, creating a unique halo vehicle for the brand’s crossover segment. 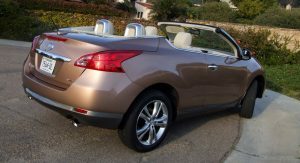 While the CC’s design is a love-it or hate-it affair, there’s no doubt that we can all agree on one aspect: it doesn’t come off nearly as badly as those photoshops which alluded to an aftermarket convertible conversion. 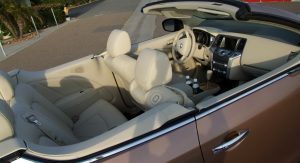 This proper execution is thanks to a significant redesign of everything from the windscreen / A-pillar back, while keeping external dimensions similar to that of its hardtop counterpart. 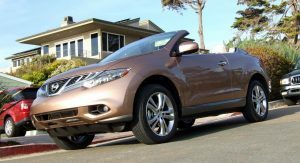 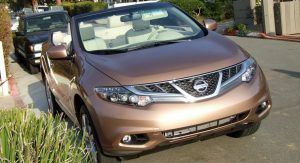 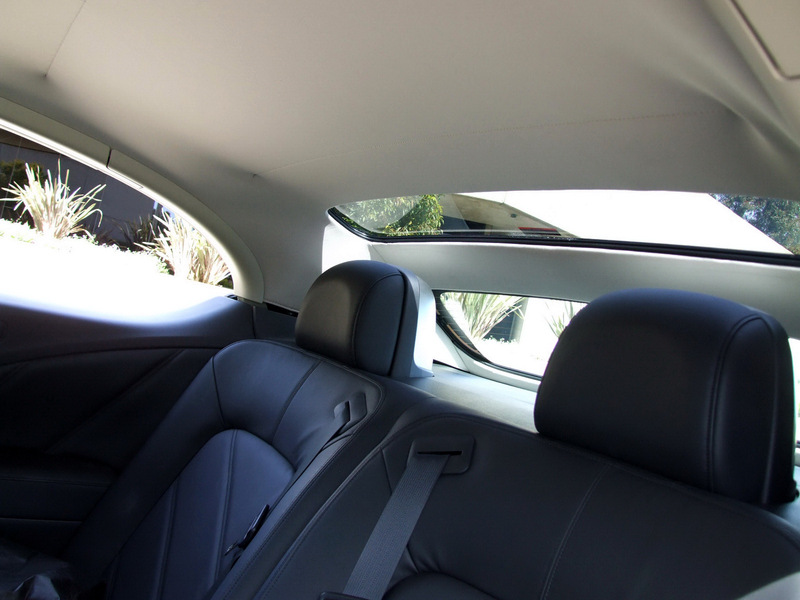 Nissan has also found a way to retain the Murano’s “J-Motion” belt line that, with the top down, adds a sense of continuity when following the invisible roofline back from the A-pillar. 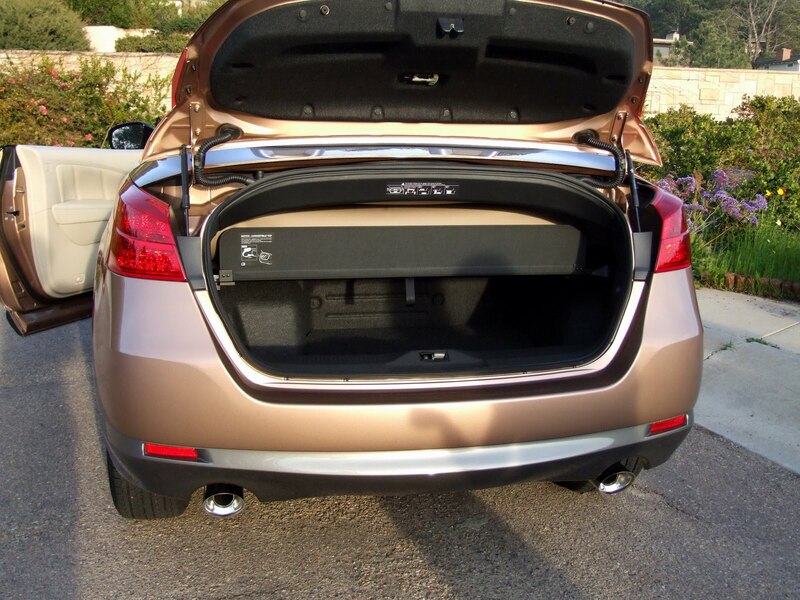 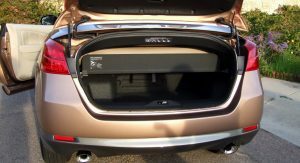 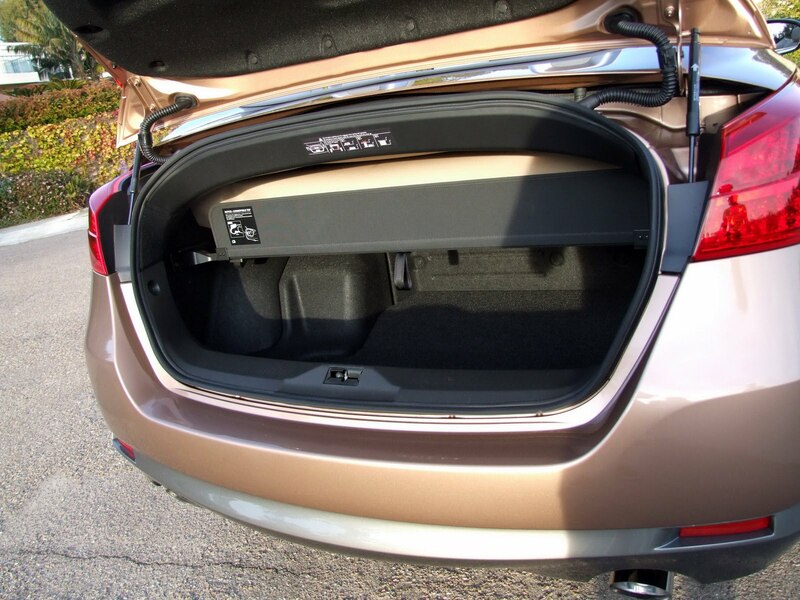 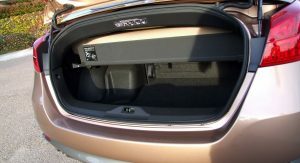 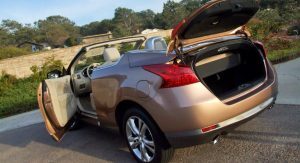 Revisions to the standard Murano include cutting out the rear doors while infusing the front units with a healthy dose of Enzyte to the tune of 7.9 inches. 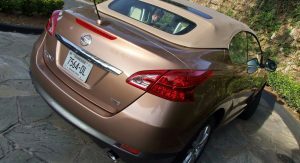 Surprisingly, ingress and egress weren’t too hampered even with more than half a foot of metal added on (although that may have simply been due to this writer’s lankiness). 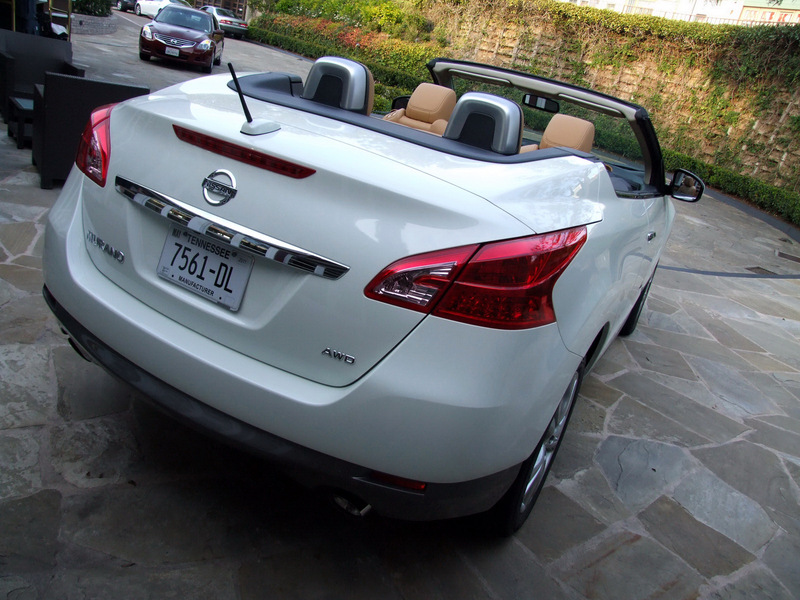 Losing all that rigidity meant that Nissan had to reinforce the body architecture…a lot. 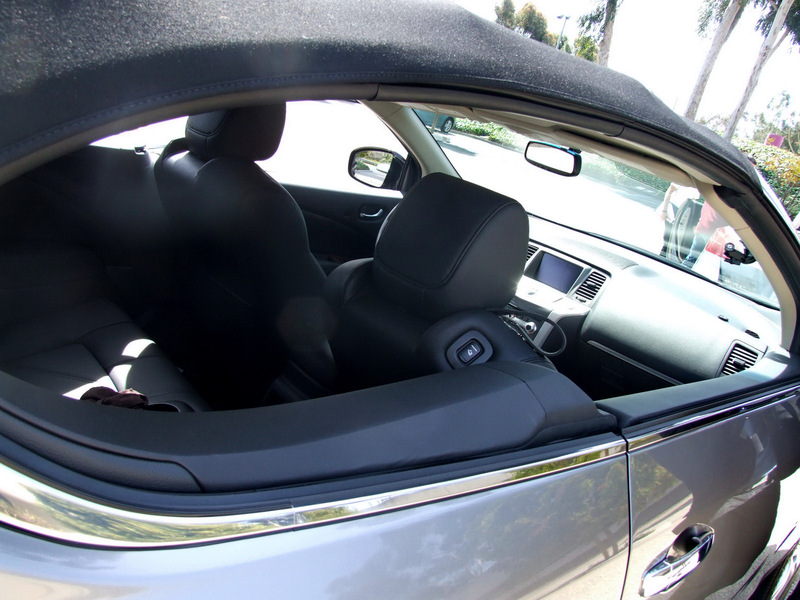 Locations deemed essential bracing points were the area formerly known as B-pillar, the floor, and the sills. 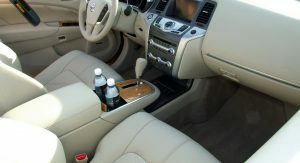 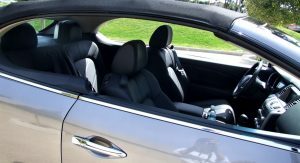 The fully automatic top, available in black or beige, drops in approximately 25 seconds; however, unlike many modern drop-tops, it can only be operated when the vehicle is parked. 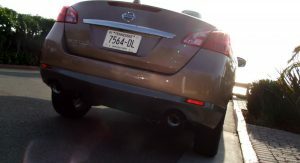 That means no slow-rolling raising/lowering should rain decide to ruin your day while puttering in traffic. 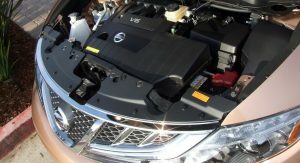 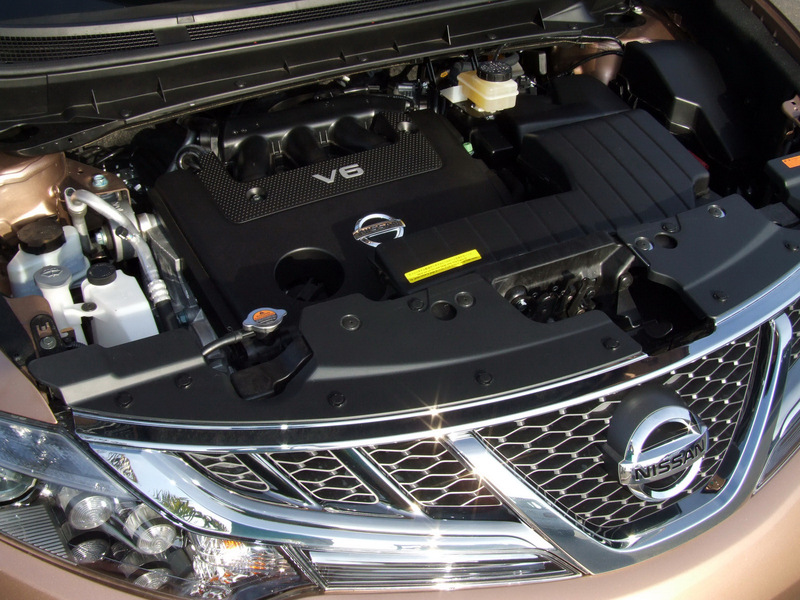 Under all the new fuss is Nissan’s familiar 3.5-liter V6 – now rated at 265 horsepower and 248 lb-ft – and an Xtronic CVT, both of which do their part to scuttle the all-wheel drive CC around with relative ease. 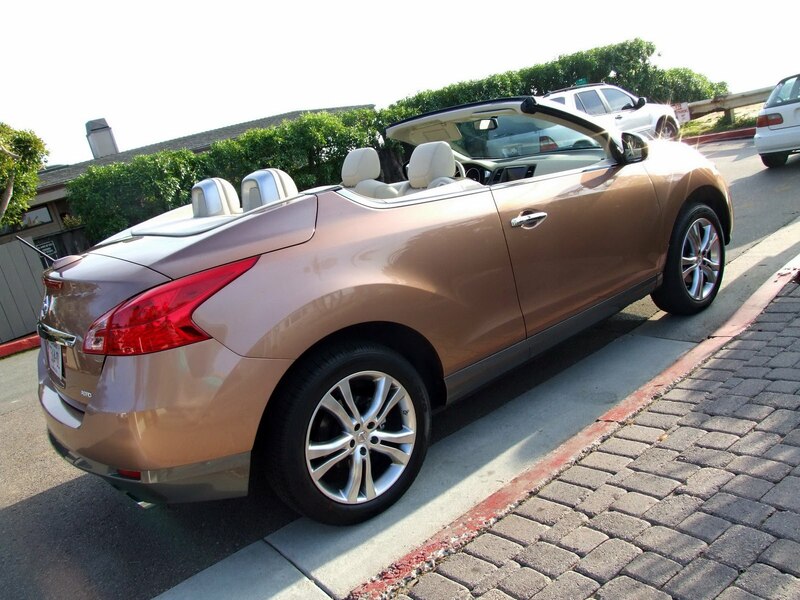 It’s no rocket, but then again it’s not supposed to be. 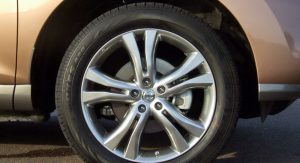 Under normal driving conditions, the CVT works like a dream, still prompting a grin at mankind’s technological advances; unless putting the pedal to the proverbial metal, acceleration is smooth and uninterrupted. 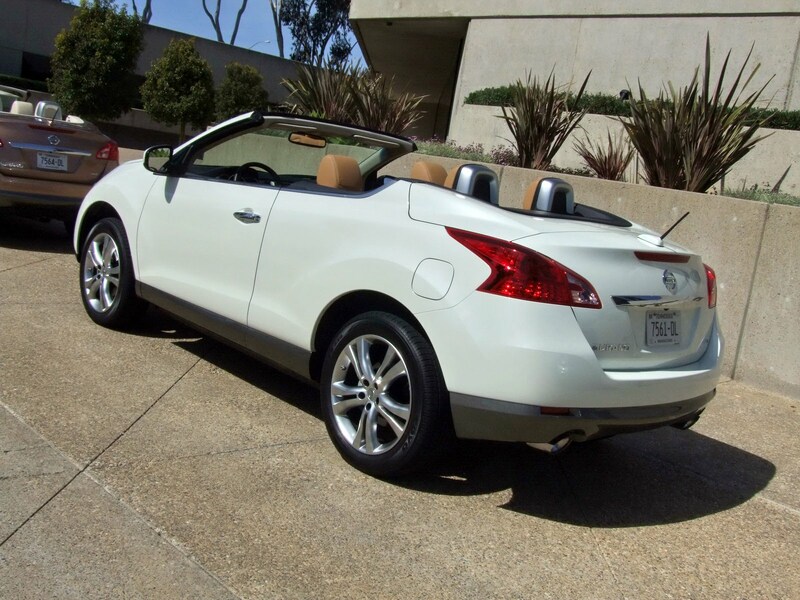 Ride quality may have been a tad fluttery when rolling over some of San Diego’s not-so-well-paved roads in a convertible crossover on 20-inch alloys, but this is to be expected when lobbing off a vehicle’s roof, B-, and C-pillars. 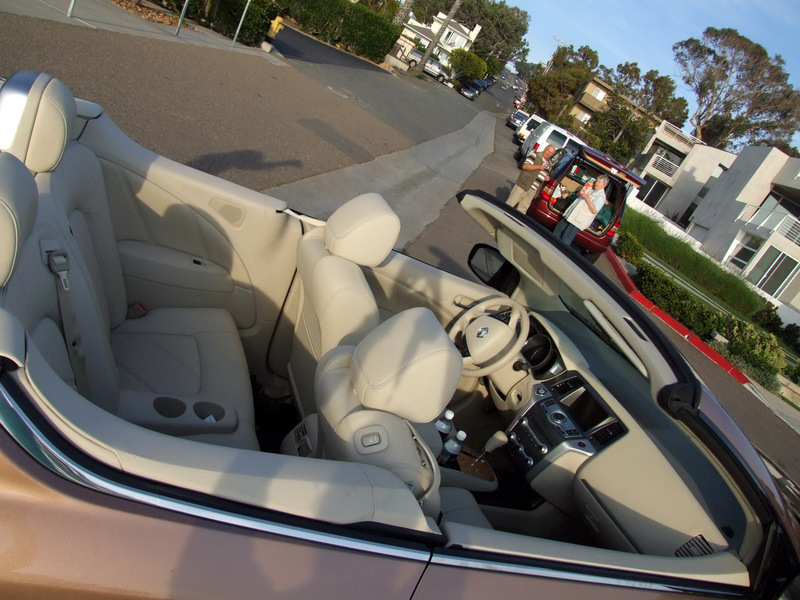 On the boulevard, however, the ride was smooth and relaxing as expected. 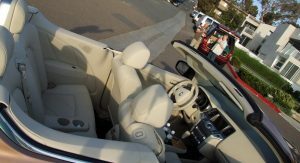 Top-up motoring is fairly standard for a convertible, meaning there are compromises to be made in sound quality due to the soft top and lack of bulletproof glass. 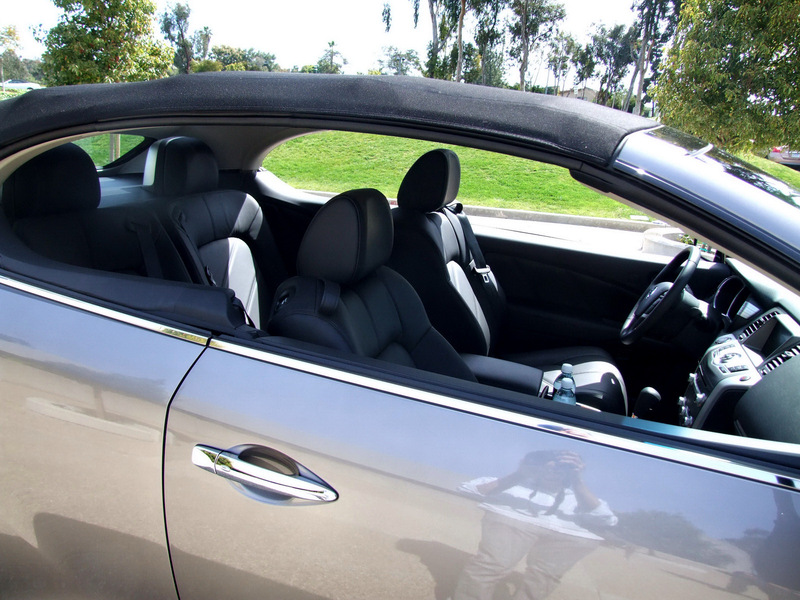 With the top down, all that has to be said is this: turbulence mitigation is lacking. 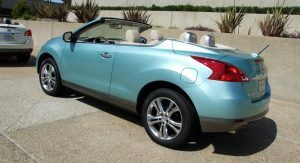 One cohort expressed that she was “swimming in [her] hair”, but the most noticeable issue was the lack of rear seat belt retainers, which led to an unsophisticated flapping at highway speeds. 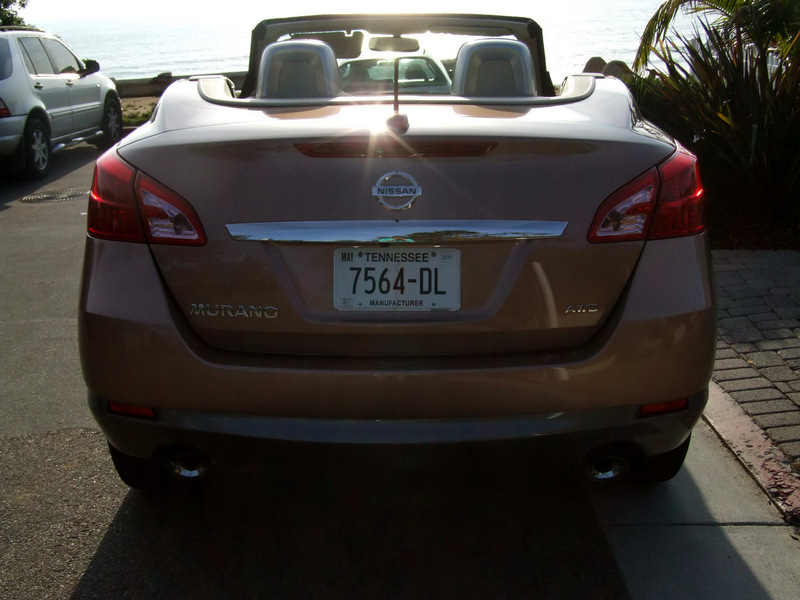 Other than a bit of buffeting, though, sky-filled driving was a pleasure. 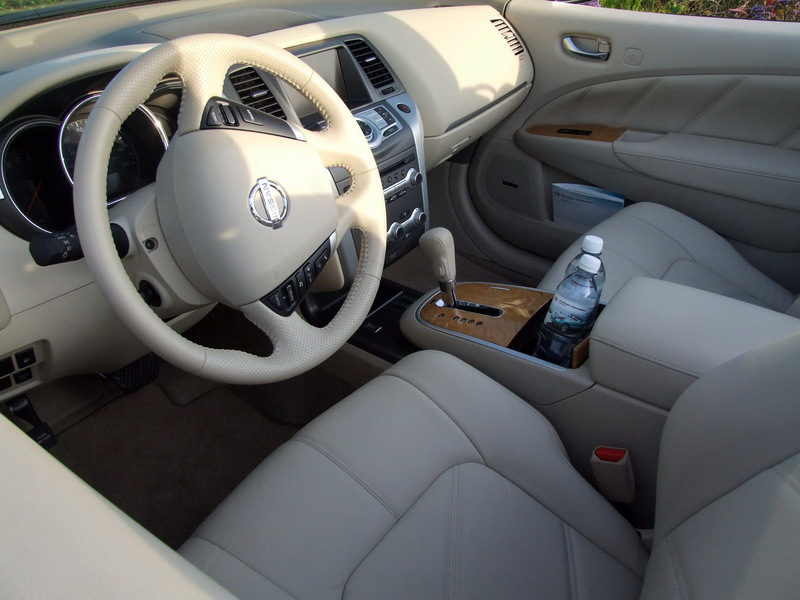 Steering feedback is a different story. 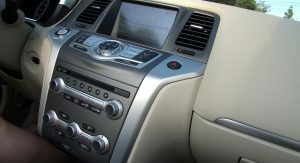 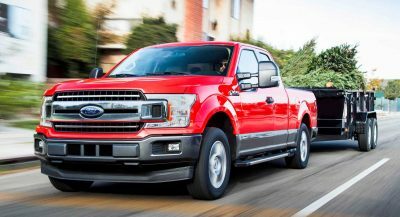 Even in the premium market, where ease of use and lack of effort are lauded incessantly, the electronically assisted steering of the CC was beyond feather-light. 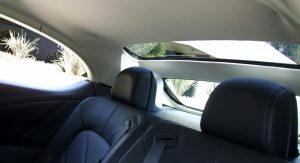 TOO beyond feather-light. 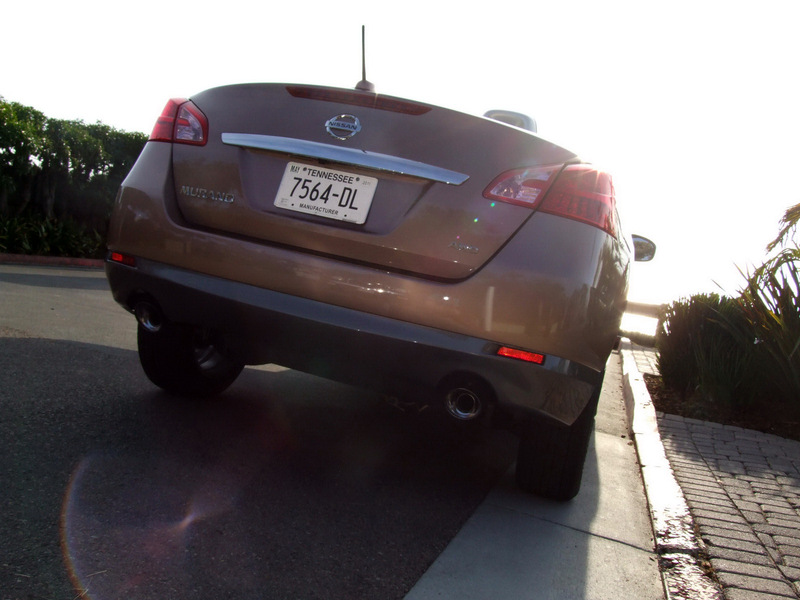 When maneuvering around a parking lot, it was almost impossible to feel any communication between the driver and the tarmac. 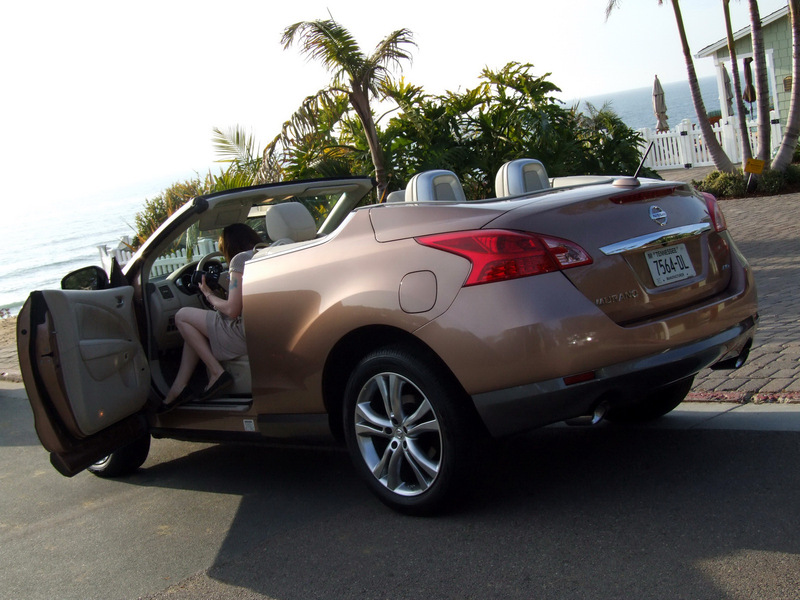 Not until reaching cruising speeds did it feel like anything was actually happening. 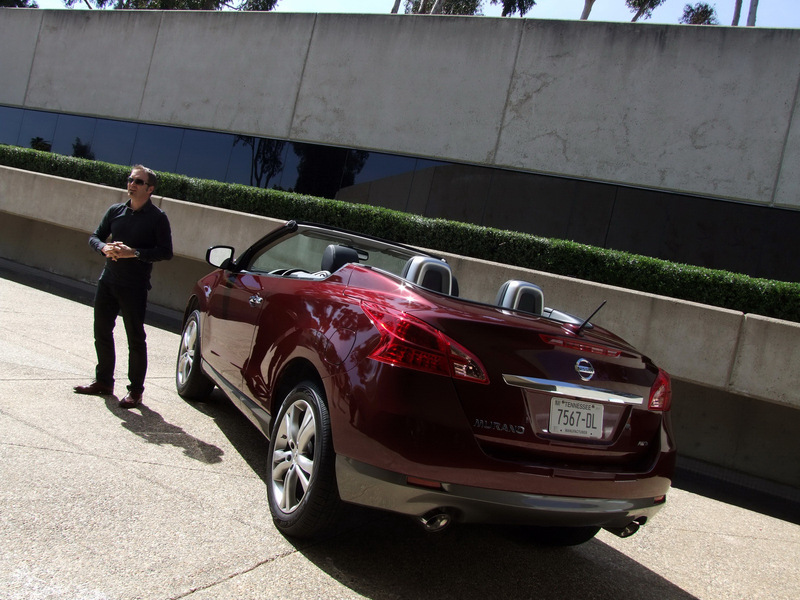 Some would say that’s the point, but what’s steering without feedback? 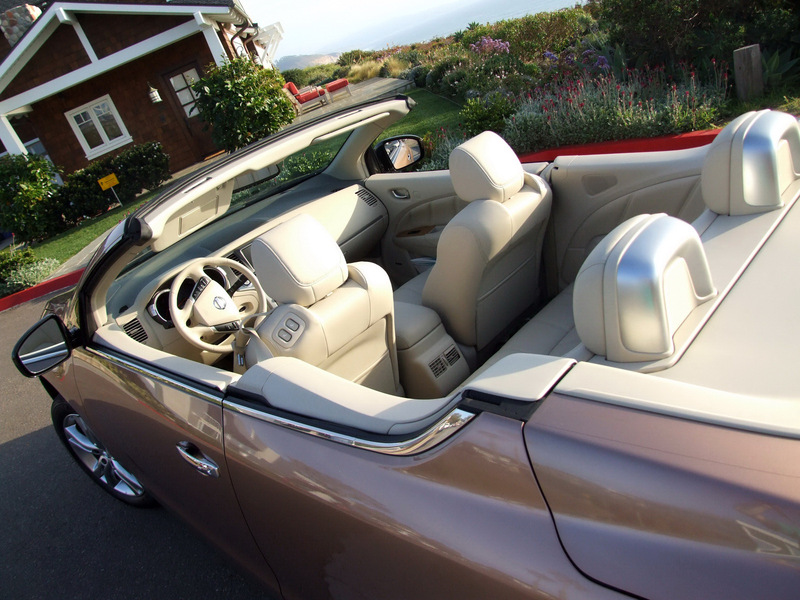 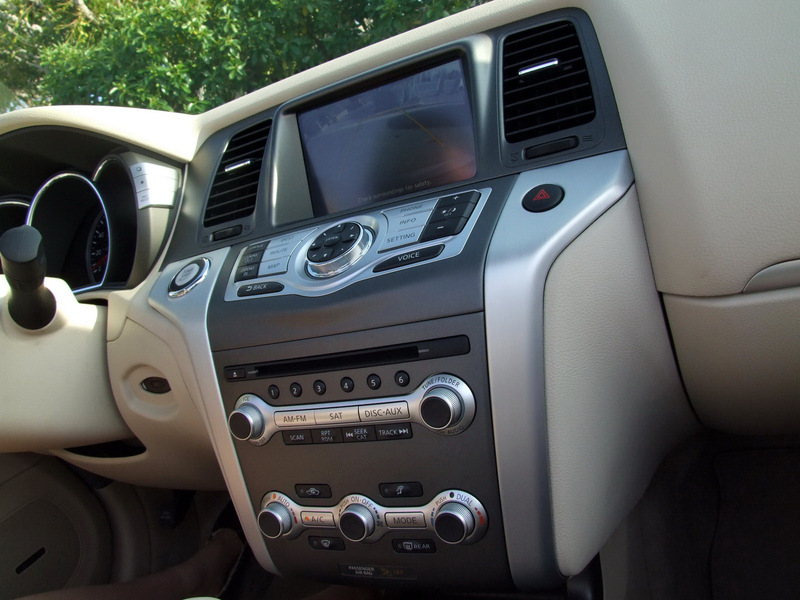 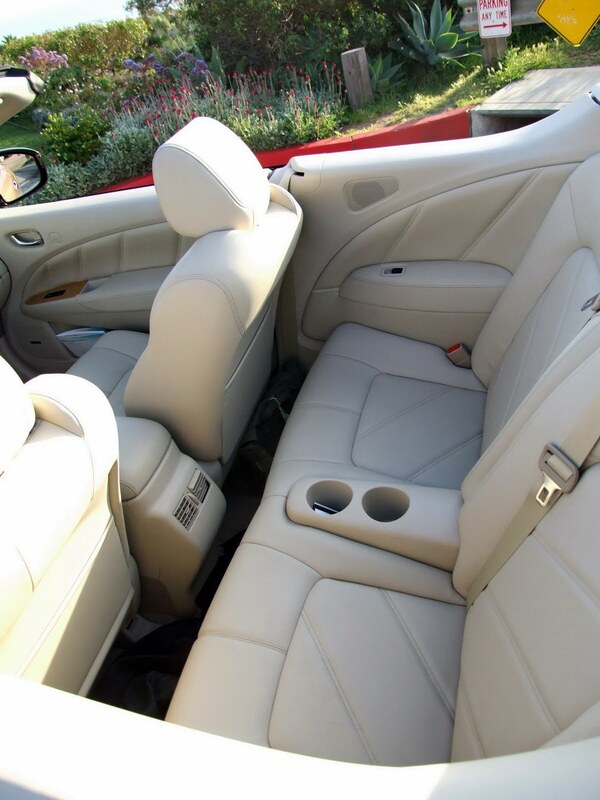 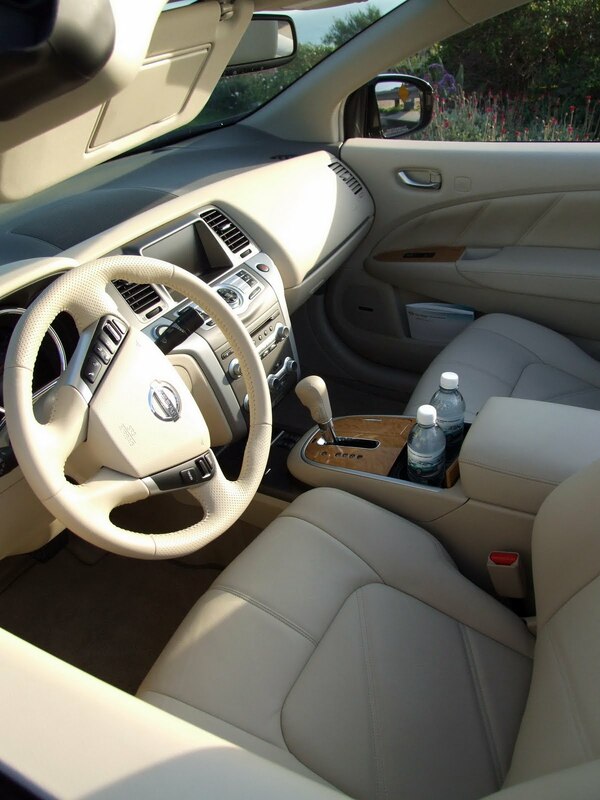 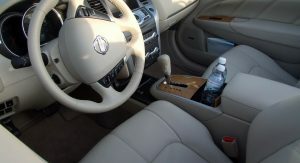 The interior of the Murano CrossCabriolet is quite comfortable for both drivers and passengers. 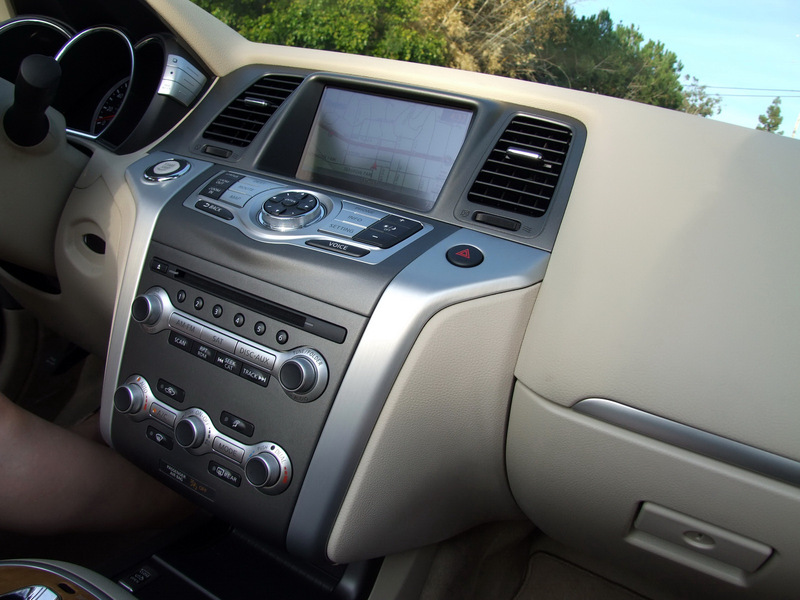 Glare is hardly an issue for the CC’s bucketed gauges, but the navigation system’s screen could really use more of a hood to improve those quick glances during sun-baked driving. 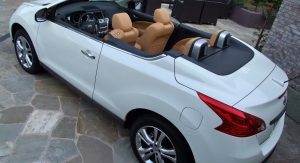 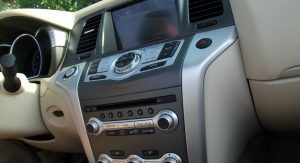 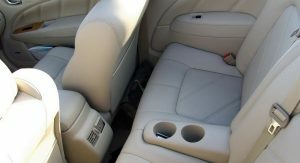 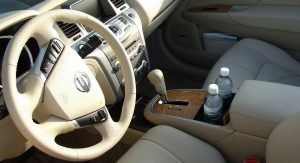 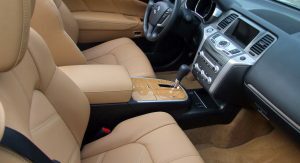 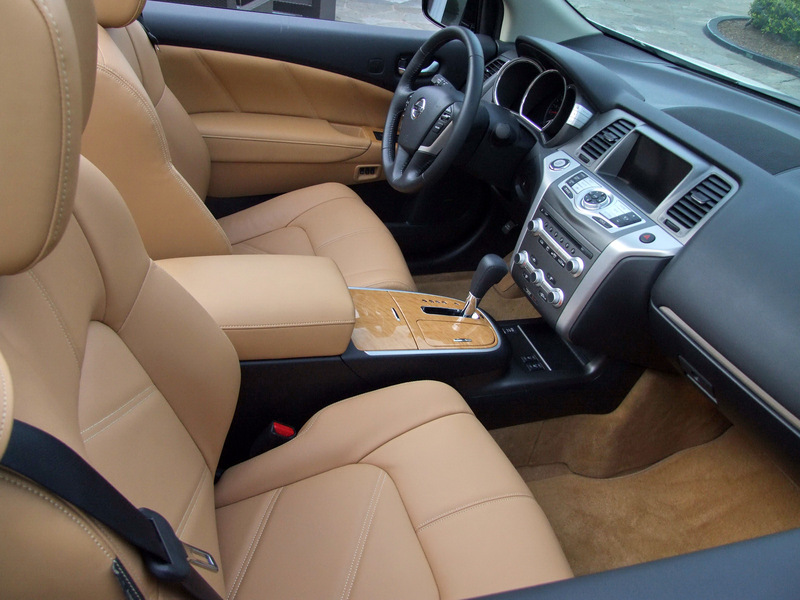 Soft-touch materials are found throughout, and the only option available is $500 “Infiniti-grade” leather with quilted seat backs and door panels in Camel or Cashmere. 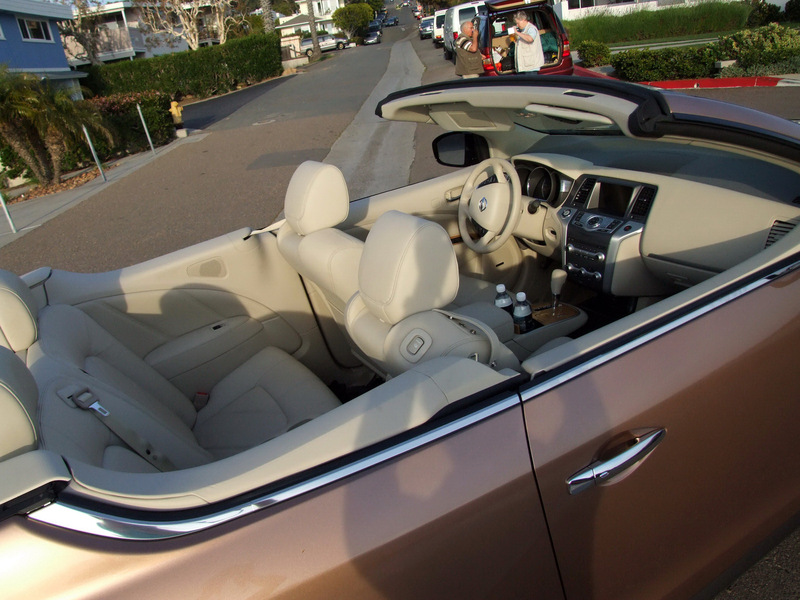 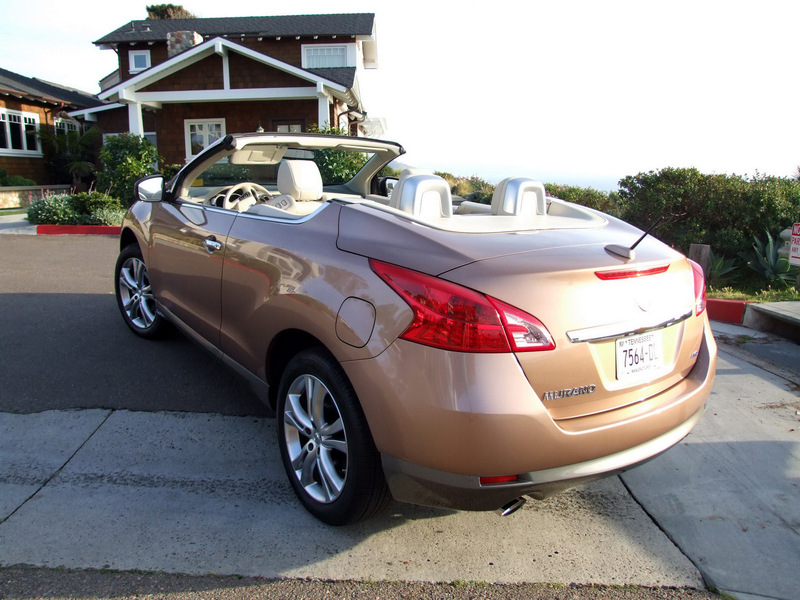 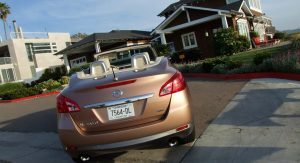 Paired with the CC-only shade of Caribbean (Sunset Bronze is also unique to the CC), the Cashmere interior really makes this convertible crossover appear at home on the coast. 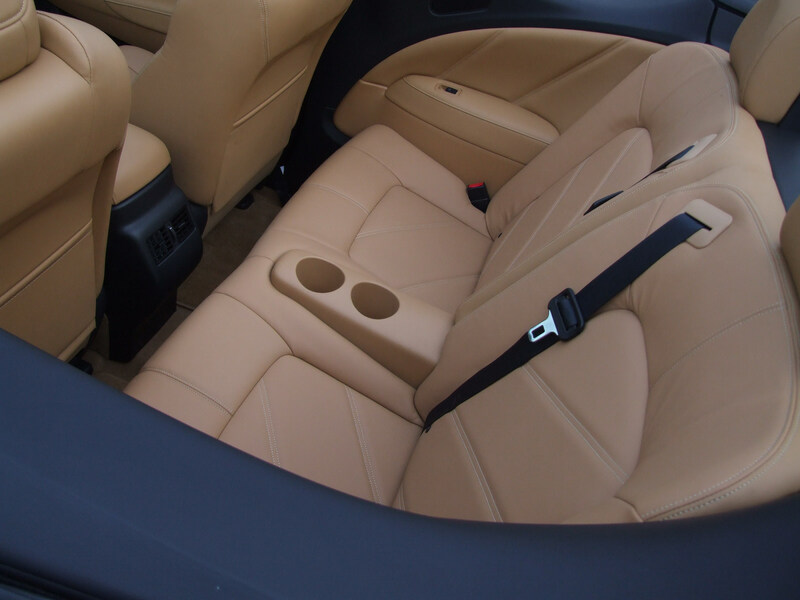 The front seats’ shoulders are more relaxed, tapering down to allow for improved rear passenger visibility, while the rear seats – now transformed from a three-seat bench into the traditional two-seat convertible setup – enshrine passengers in leather and speed-sensing Bose acoustics. 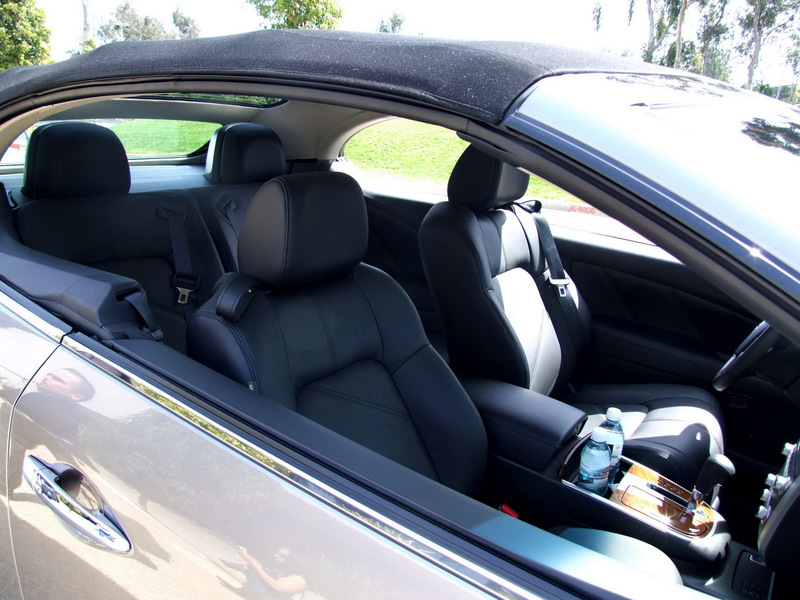 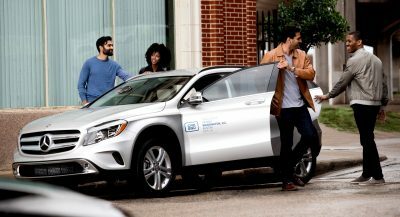 Even with the front units set to a 6’2″ driver’s comfort, there’s still plenty of legroom for a same-sized passenger to sit in back. 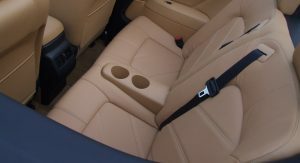 Despite the redesign, the front seats are one of the weakest points of the interior. 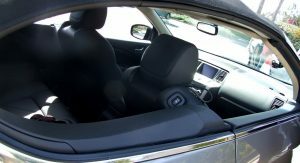 Instead of integrated seat belts (or retaining brackets), there’s a strap with little button clips that has to be undone each time rear passengers are involved. 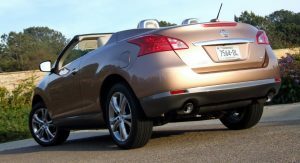 The finagling isn’t terrible, but doing this dance enough times will make you want to simply leave the belts out of their seat-straps. 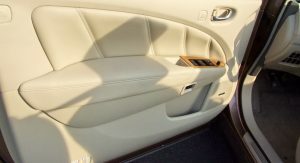 Another qualm: in an attempt to go luxury and convenient at the same time, Nissan opted to have the driver’s seat fully powered while the passenger’s seat has a manual recline/rear entry function. 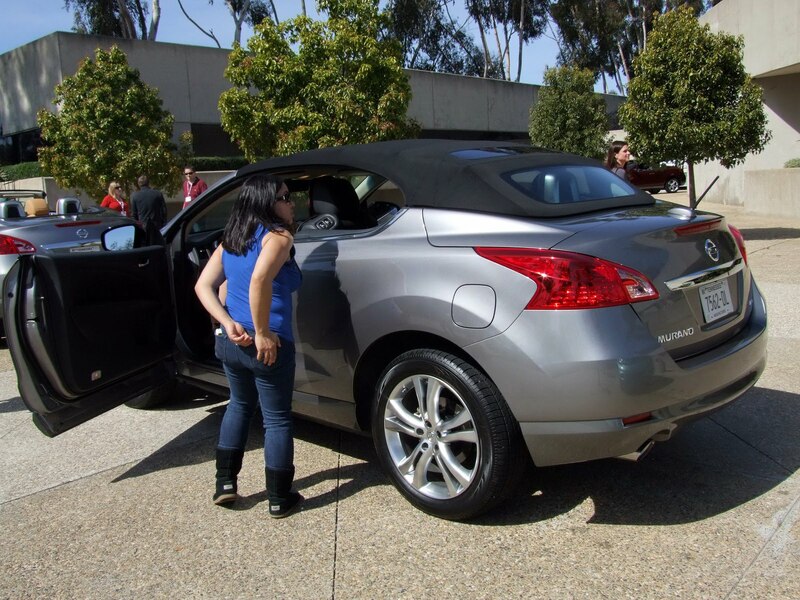 The luxury power feature is nice, but slows rear accessibility to a crawl. 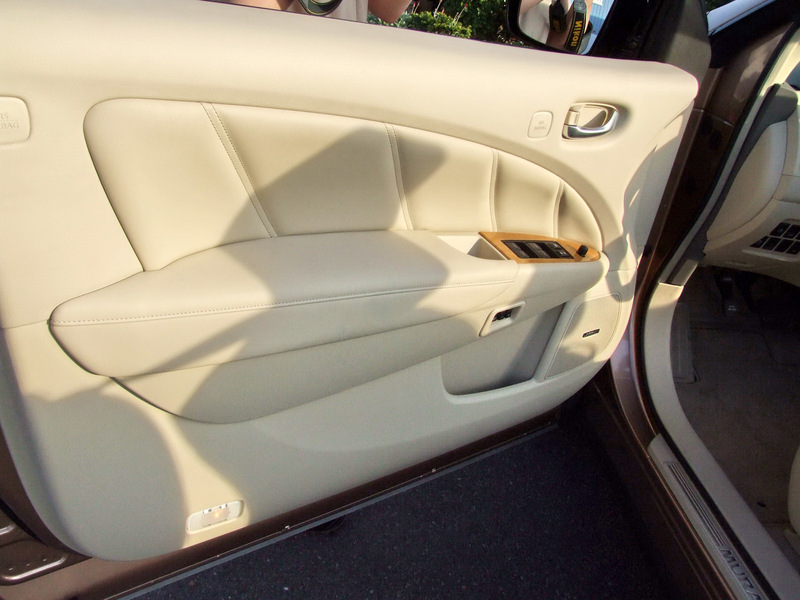 On the other hand, the passenger seat moves speedily enough to grant access to the back seats here-and-now, but is manually operated. 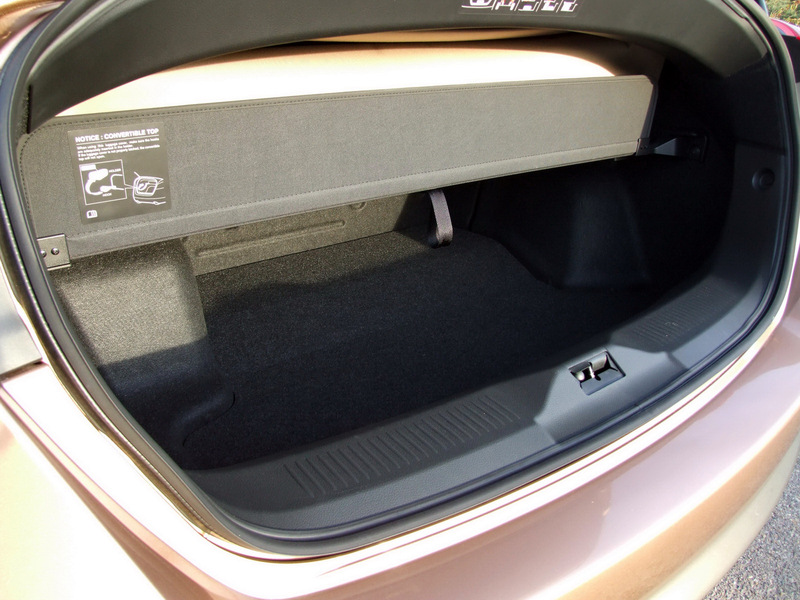 It’s up to consumers to decide if this manual function is plebeian or practical. 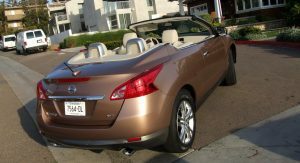 One could say it’s the best of both worlds, but it also comes off as unwillingness to commit to one decision or the other; odd, considering Nissan is fully committed to a crossover convertible. 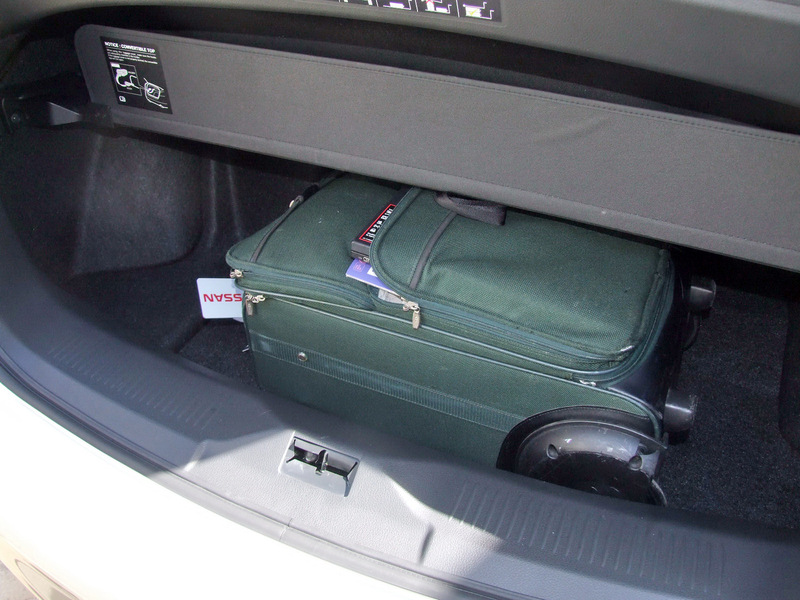 As is the case with convertibles, luggage space was another area of compromise. 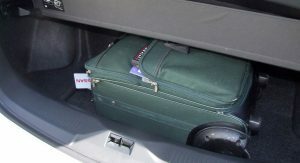 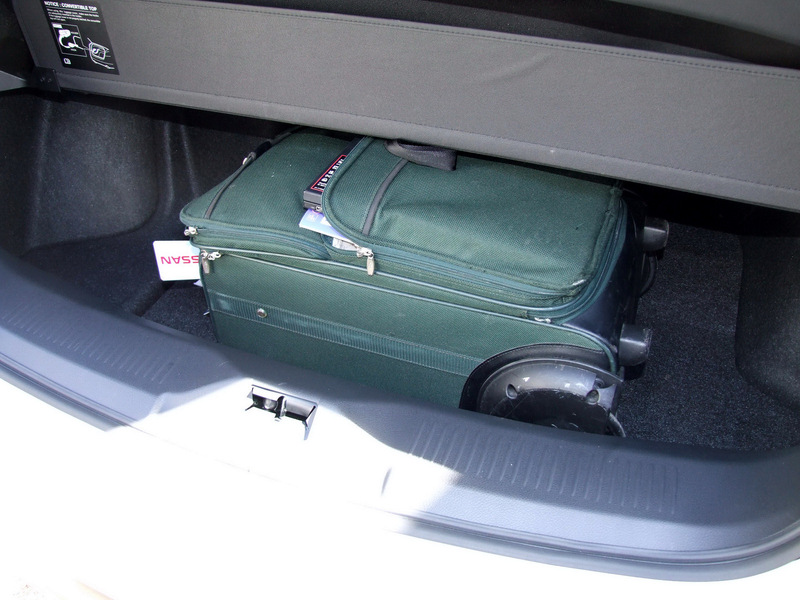 Knowing this, it was still a hassle to jimmy a carry-on roller suitcase into the trunk with the top down. 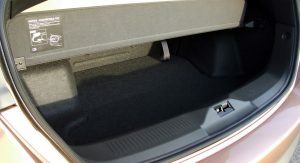 This is not necessarily a regular occurrence, but one would think that in a vehicle meant to provide crossover functionality there would be at least another inch or two to play with. 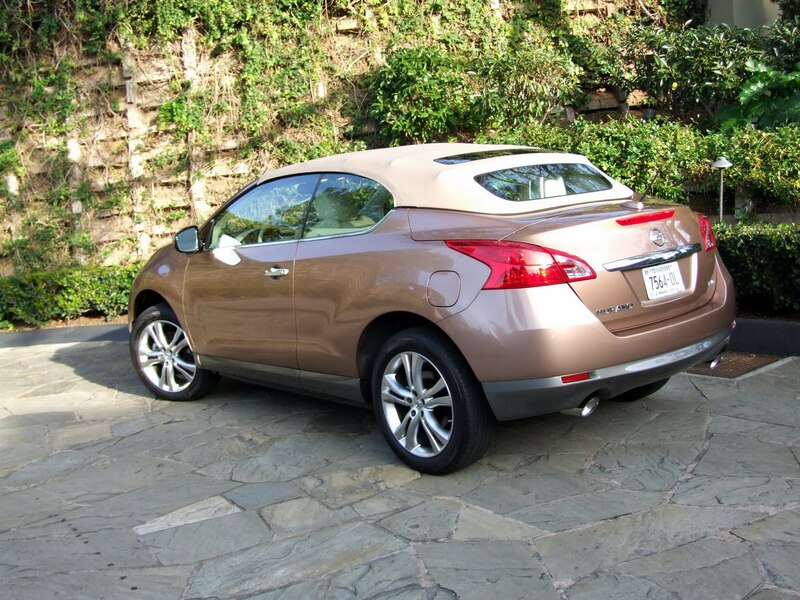 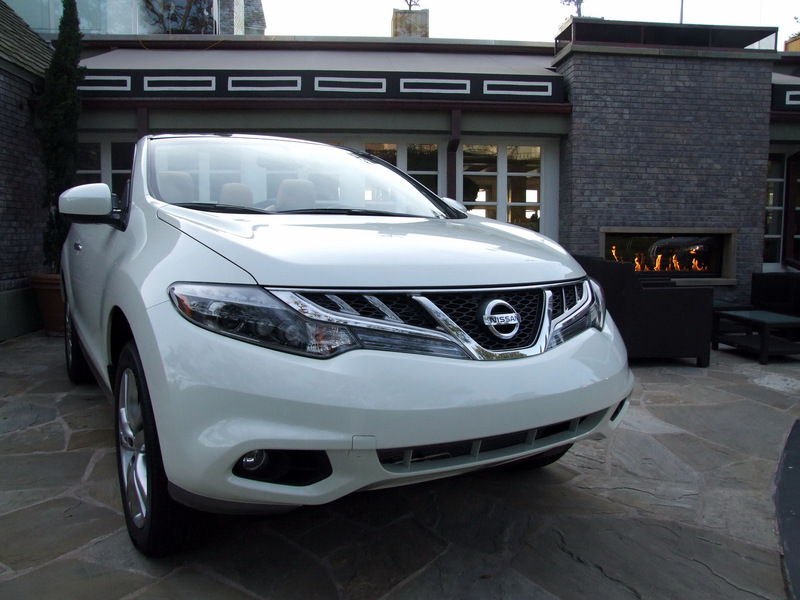 As Nissan puts it, the Murano is a car for empty-nesters. 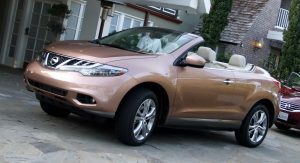 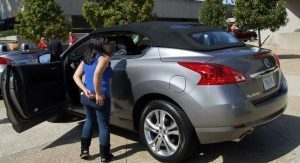 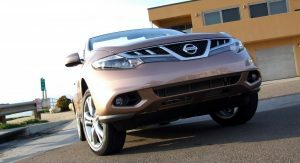 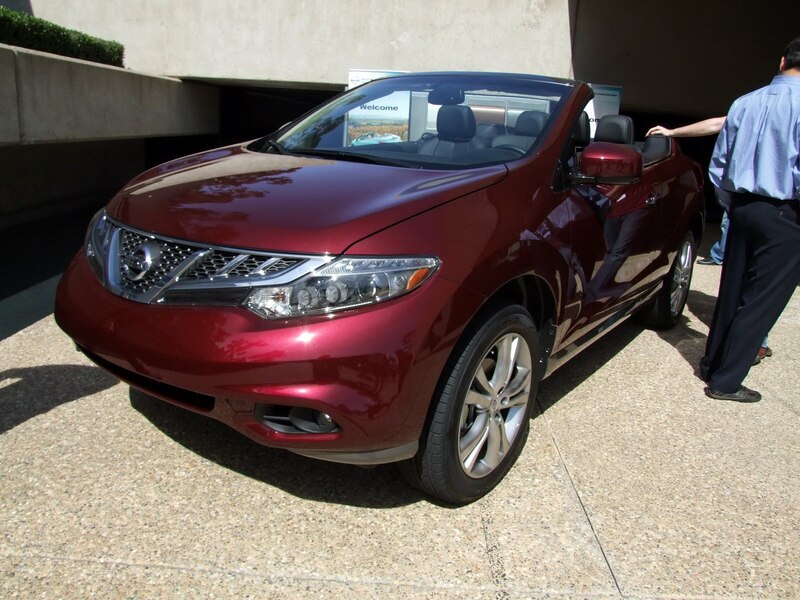 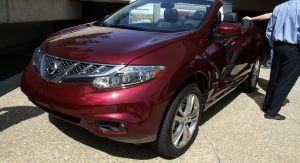 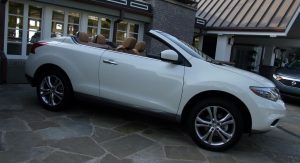 With the Murano CrossCabriolet, the brand hopes to appeal to higher income ($125,000+ / year) Murano-esque consumers who are slightly younger, “savvy” and adventurous, but with kids in high school. 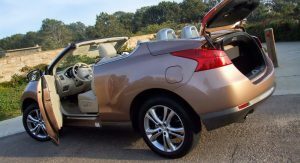 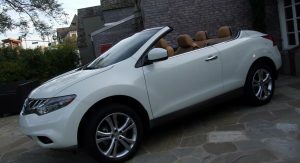 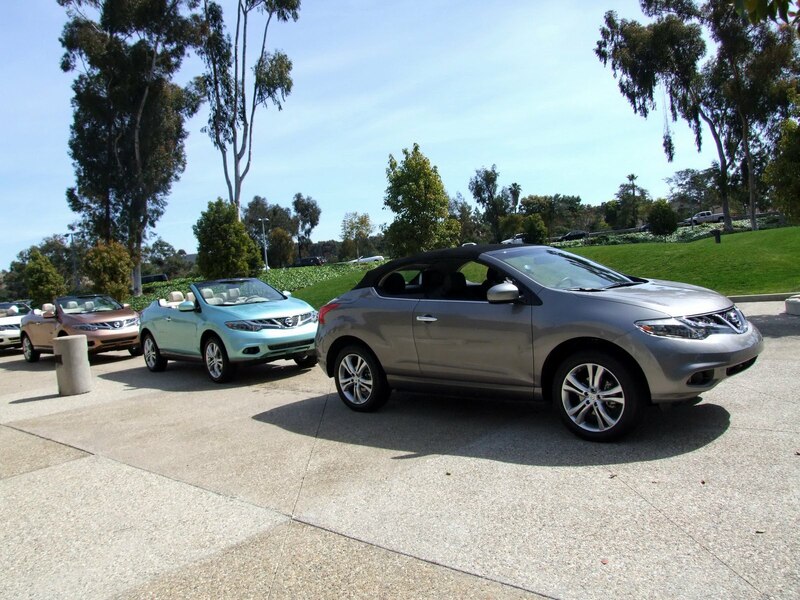 The CC is a crossover convertible, meaning this Murano looks to kill two birds with one stone: owning a convertible and maintaining utility, meaning offering a usable convertible as a second household car instead of a third. 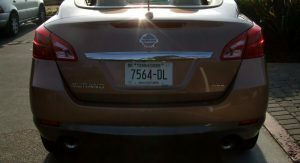 Whether or not that is truly the case, only time will tell. 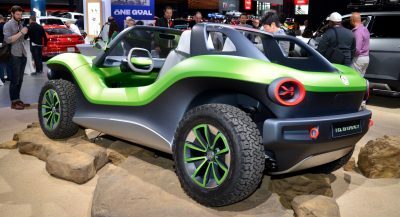 Either way, with over 900 pre-orders and significant interest, the response is there. 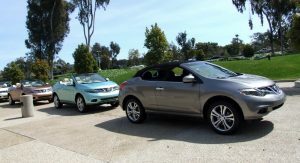 As for whether or not we’ll see another generation, well, that depends on if there are enough Beetle convertible owners and middle-age moms out there who want to keep their car, possibly get some sun, and increase utility. 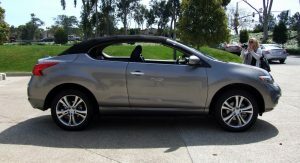 At $46,390 (plus $810 D&H) is it the car for me? 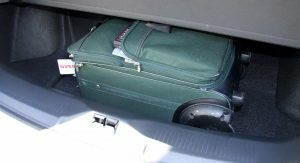 No, but it could be for some people. 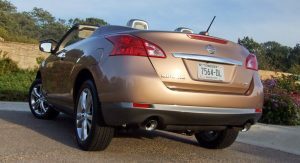 The bottom line is this: nit-pickery and little flubs aside, kudos to Nissan for being brave enough to break the mold and then put the result into production.